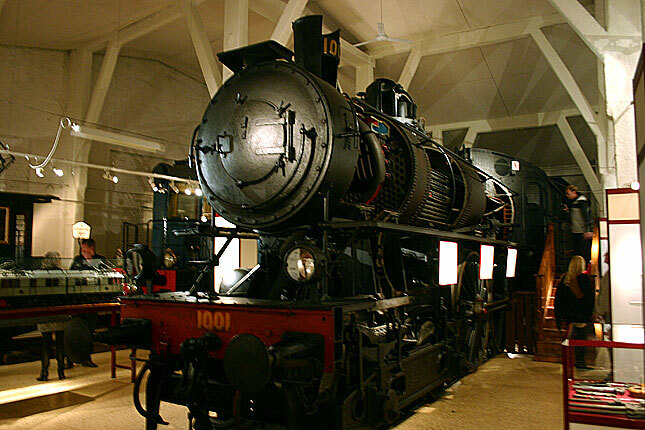 This is the oldest surviving steamer in Sweden. 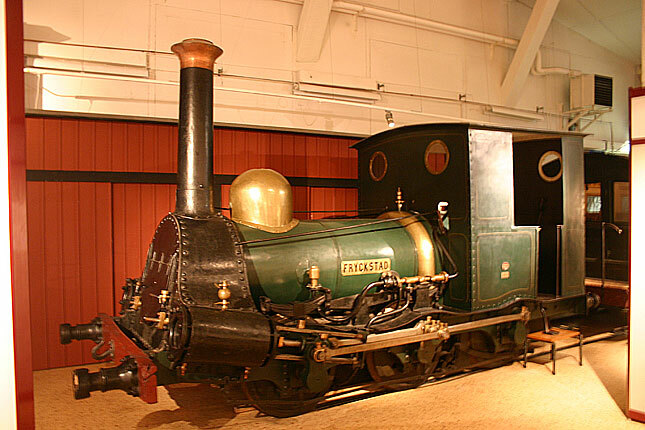 Named Fryckstad this ox looking engine dates from 1855. 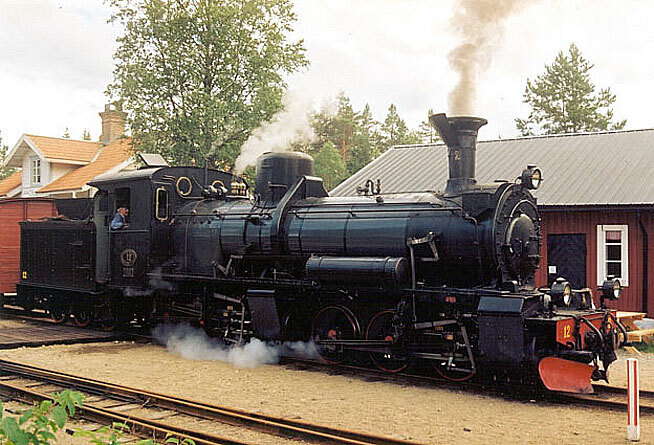 The engine ran on 1101 mm gauge and was the first steam engine on the line between the rivers Fryken and Klaraälven. 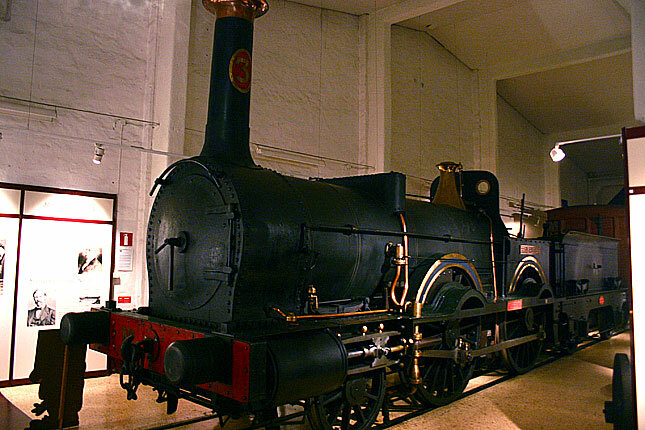 The line was opened by the King Oscar in 1850 and in the fist years it was horse powered and as the line ceased its operation it was used for the cosntruction of the fortifications near the naval base of Karlskrona. 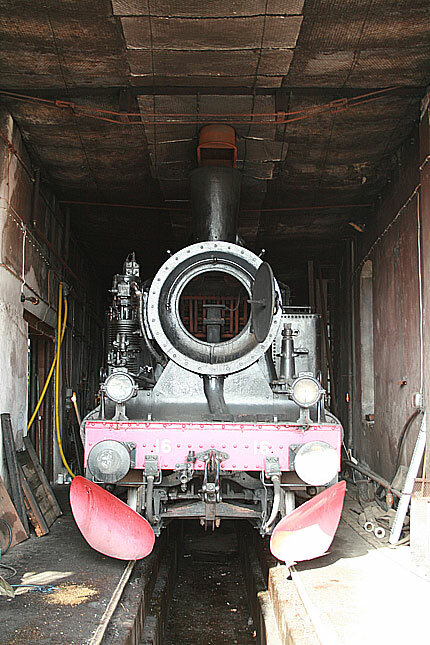 The engine was reserved for the National Railroad museum in 1906. Gävle 2008-08-31, the photo below 2009-09-12. SJ B 3. "Prins August"
In the early days it was rather easy to see what the engine was designed for. 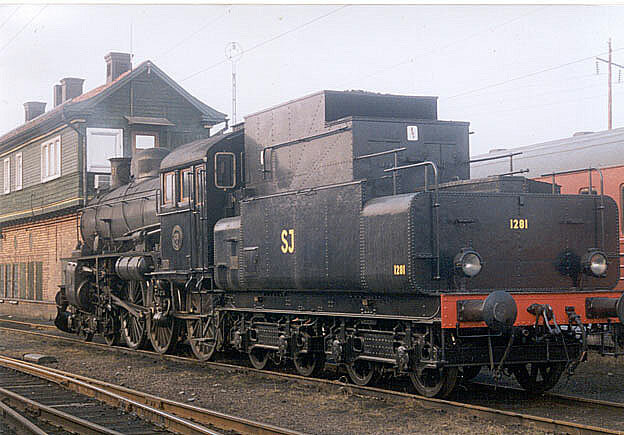 If it was equipped with a rather huge single driver it was for passenger train (on SJ class A), with smaller pair of drivers a dual service engine (class B) and three axles of drivers freight only (class G). 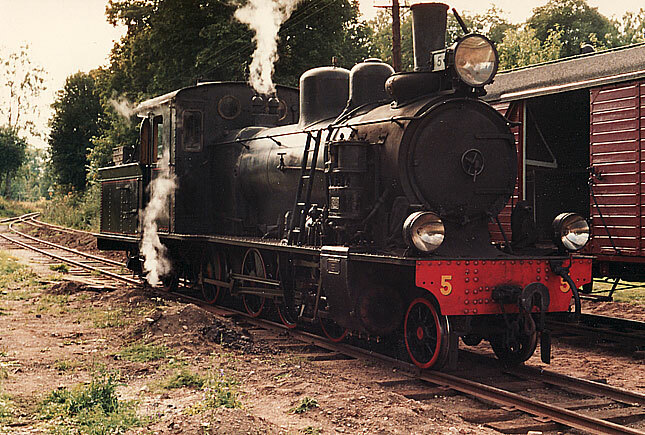 The A class were constructed between 1863 and 1873 and the only surving engine, A 75 Göta is still fully operational. 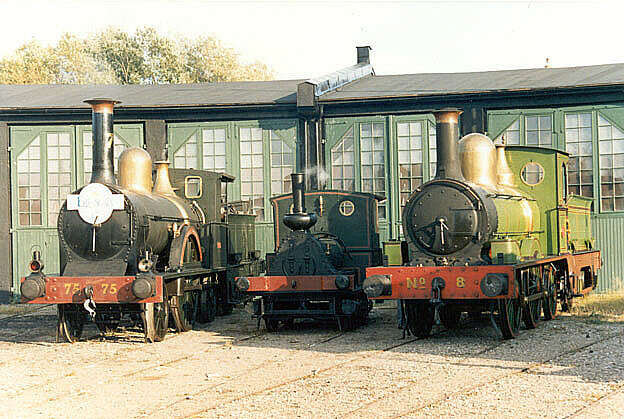 Three veterans from the early days of steam from left 2-2-2 Göta, the tiny 0-4-0T "Elfkarelby and 0-4-2 OFWJ 8. 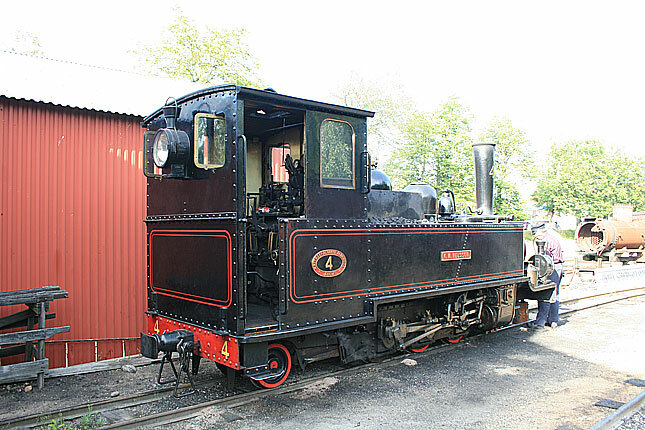 One of the oldest tank engines in the country is still under staem, the 0-6-0T saddle tank was built in 1872 in England. Nora. 2009-05-02. 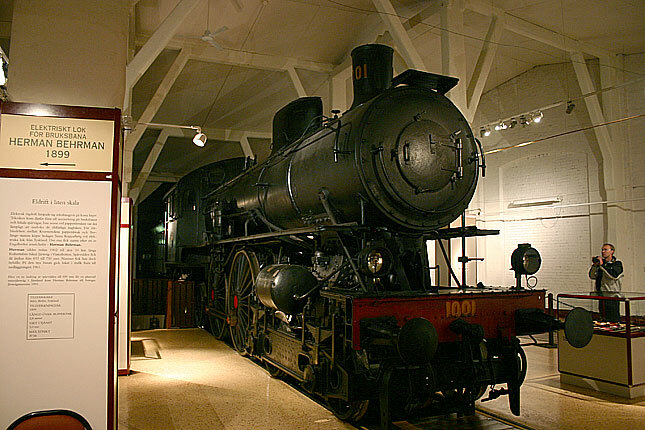 The heavier passanger trains and the new heavier equipment caused SJ to design a new fast passanger train engine during 1890.es. 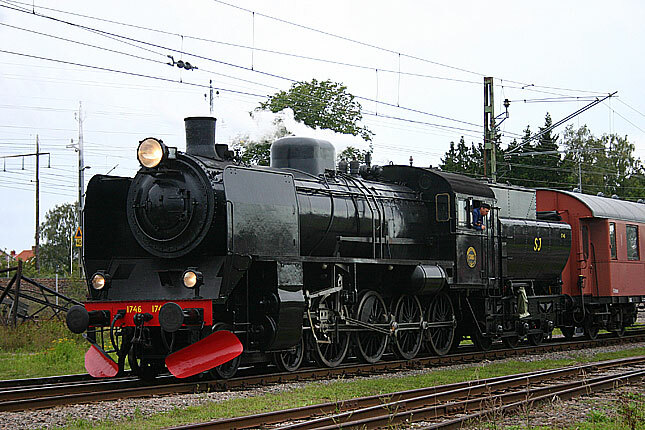 The final developement of 4-4-0.s were the Cc-class. 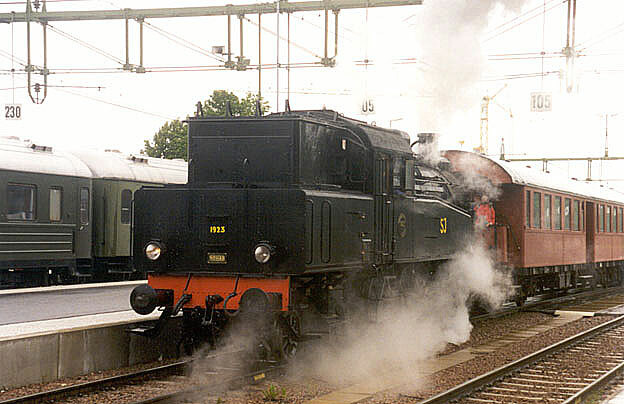 Only less than 10 years of service on the priority trains they were displaced from that service by the A-class Atlantics and few years later by the F-class Pacifics, the only Pacifics in Sweden. The Cc-class where used on secondary passanger runs and a number of the received new superheated boilers and lost much of their looks. 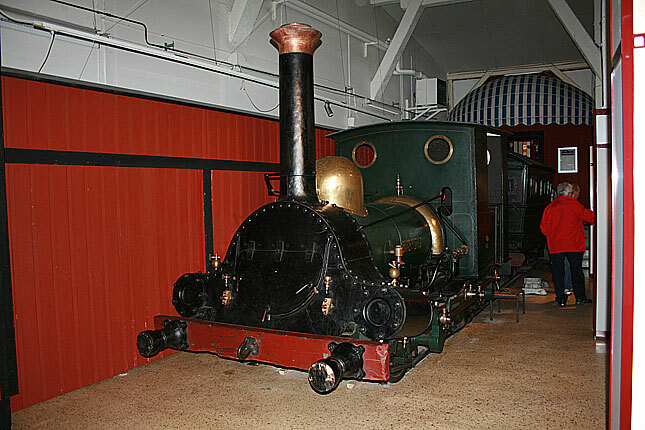 This preserved engine in the national railway Museum in Gävle kept its orginal boiler. 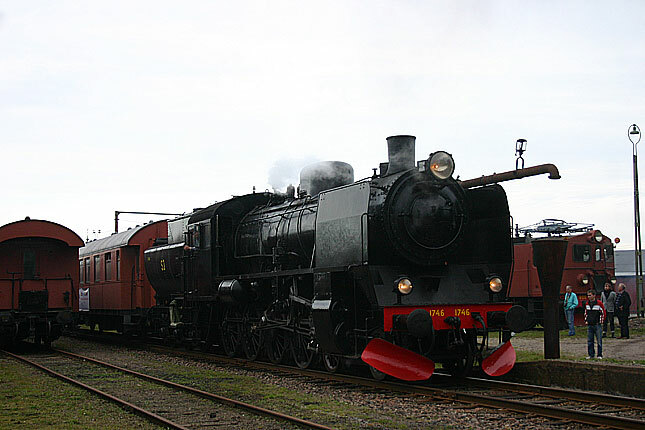 The N-class 0-8-0T were designed for the heavy iron train switching duties. 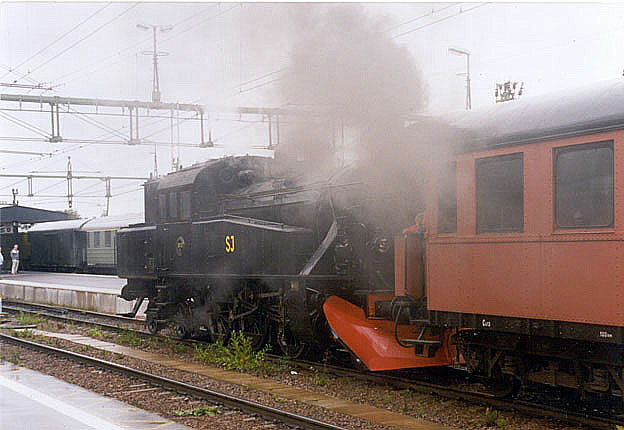 But eventually used all over Sweden in switching duties to the end of steam. 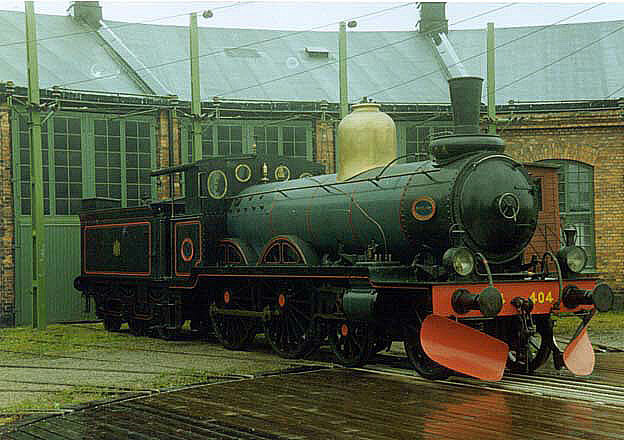 A Tb-class 4-6-0 engine painted in 1920.s scheme at the Swedish Railway museum in Gävle. 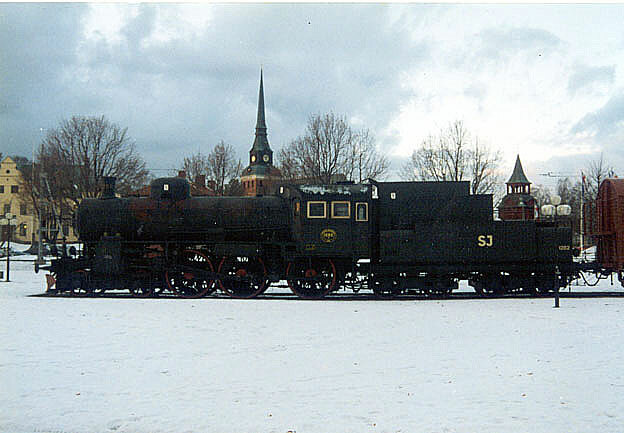 The Ta-class were the only american built tender engines ordered by SJ at the beginning of this century. Considered slow and bulky they were used on secondary passanger trains on mainlines and also in freight. 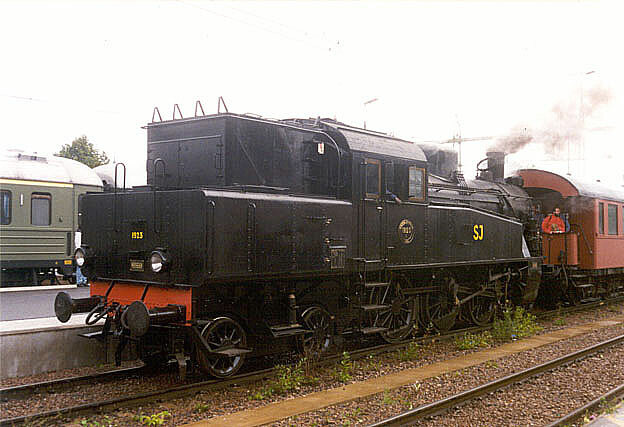 The shortage of more modern engines at the turn of the century, Sj ordered more engines from swedish shops and these engines received a number of modifications and they where classified as the Tb-class. 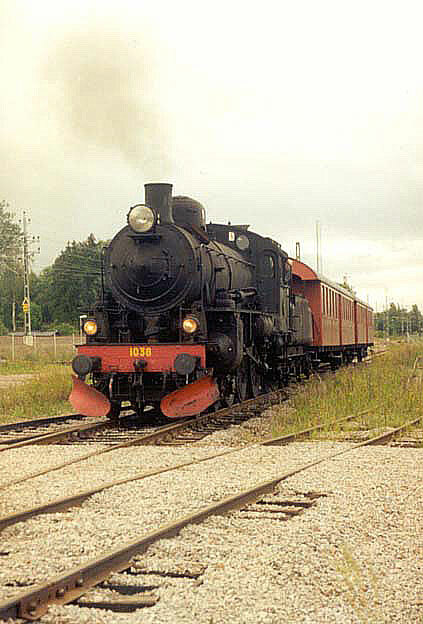 Summers are excursion time, like this train cught in Mora in 9.th of July 2003. The train will next day head up in the old hunting grounds of the venerable E2, the Inland line. 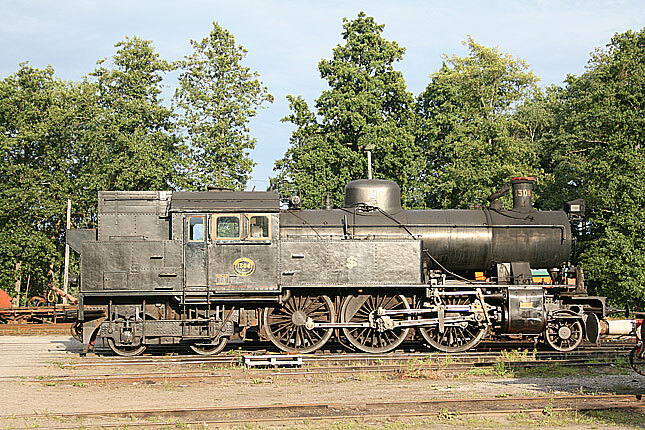 See more on this on the special feature "Steam excursion". As a result of the combination of national defence, improve etablishement and national pride, ahuge project of a line through the sparsly populate areas from north to the south called the Inlandbanan (The Inland Line) was constructed as a final of the first generation of the railnet. The southern portion was aborted in favor for channel between west coast and the Lake Vänern. The finalspike cerenomy was in the 1930.s and it was clear that the line wasn't the success as once was expected. Today most of the line, though threads of closements is still in use. Only the line between Kristinehamn - Mora is closed, making Mora the southern gateway to the forrests in north. 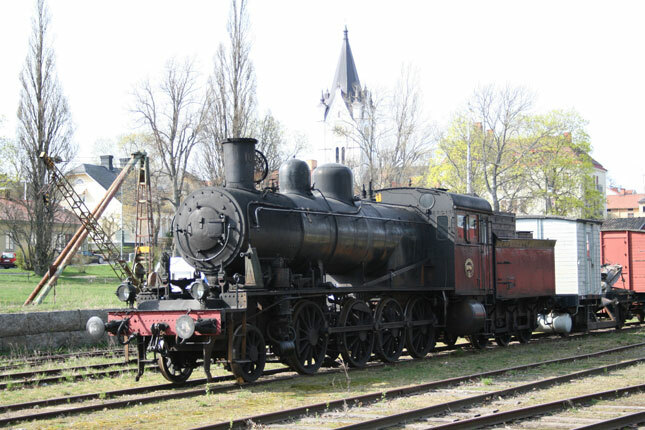 The new line needed a new type of dualserive engines, the inside cylinder 0-8-0.s of E-class. 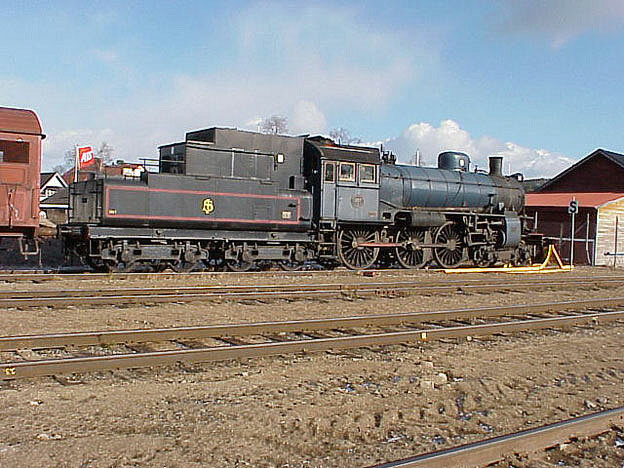 Many of the engines were rebuilt in to 2-8-0.s and reclassified as E2.s. 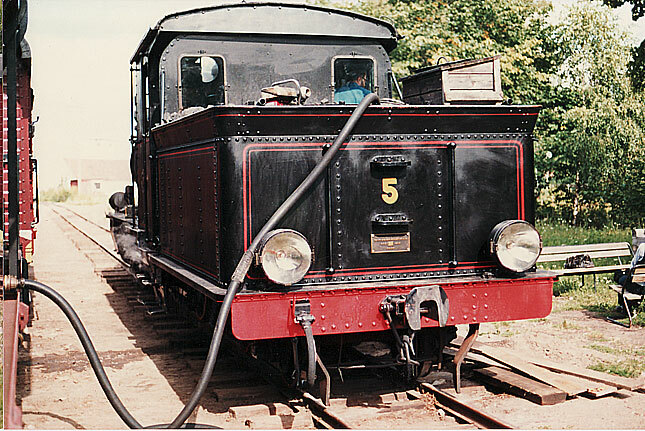 Being one of the most common type the E and E2 saw use in to end of the steam in the 1970.s, mostly used in local service on main and all kinds of service on secondary mains and number of branches, transfer and switching dutys and quite a few have been preserved on preserved lines and groups from north to south. At least one made it all the way to Canada. 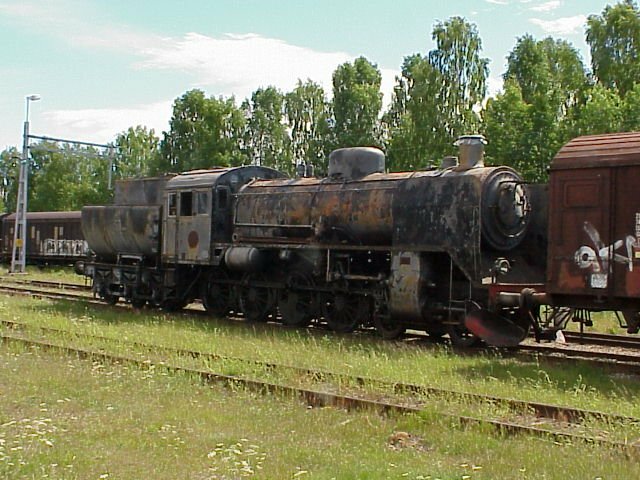 E and E2.s were the most common engines in Sweden, ith its low axle loads and 4 axles of power they proved to be very suitable for secondary lines and in to even trnsfer runs. 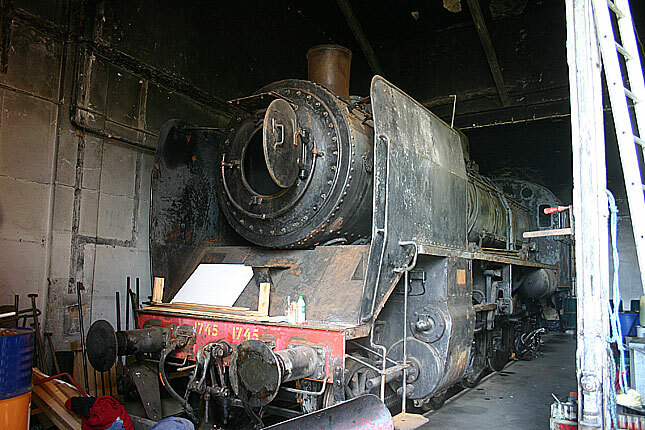 The inside rods on a 0-8-0.s isn't the best receipe on handsome engines but on the E2 2-8-0.s rebuilts reslults are much better. Nora and NBVJ is allways worth a visit not only because the enviroment looks like a time machine back to the hey days, but also they have enough equipment to manke thing s look right like this little freight behind this venerable steamer. Nora 2009-05-02. 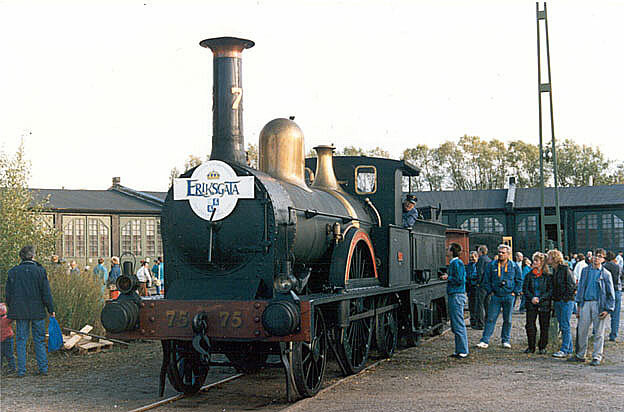 One of the most successful of engines in Sweden was the E-class with 129 built, they became the most numbered steam engines in Sweden. 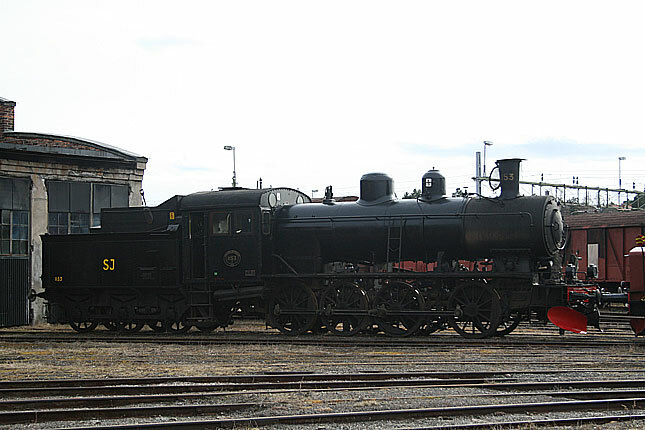 They were built for the lighter rails on the secondary lines in mind and many of them were rebuilt in to E2-class 2-8-0.s to even improve their riding qualities even more. 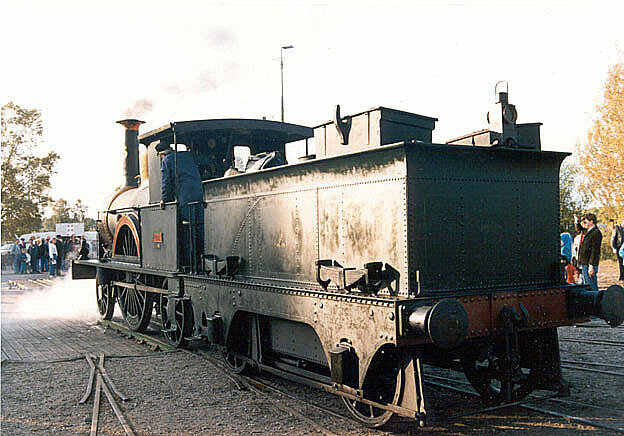 They got a very long time of service and were among the last classes of steam engines along the B-class, S1-class and the former private A6 in service still used untill the steam was banned in early 1970.s. 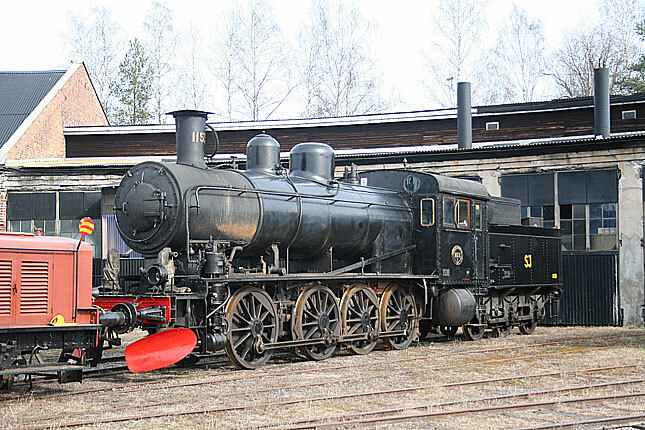 One of the unrebuilt 0-8-0 E-class opwned and operated by the rail preserving group MfGDJ is here prepared for an annual Easter fan trip from Falun to the paper mill town of Grycksås some 15 kilometers west of Falun. Falun 2012-04-05. A pair of sideview shot to show the difference between E and rebuilt sisters. There were within time two alternative dome configurations. 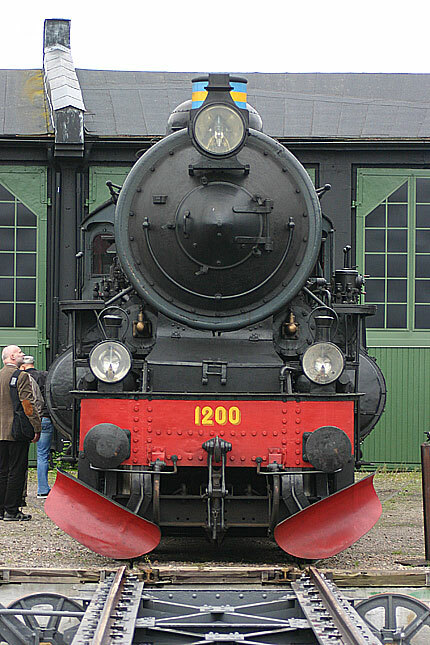 The E-class displays the orginal arrangement on both versions, while some engines received the combined dome, which was otherwise quite common on other classes and types of Swedish steam. Both shots from Grängesberg in 1994. A pair of details on a E-class steam engines. 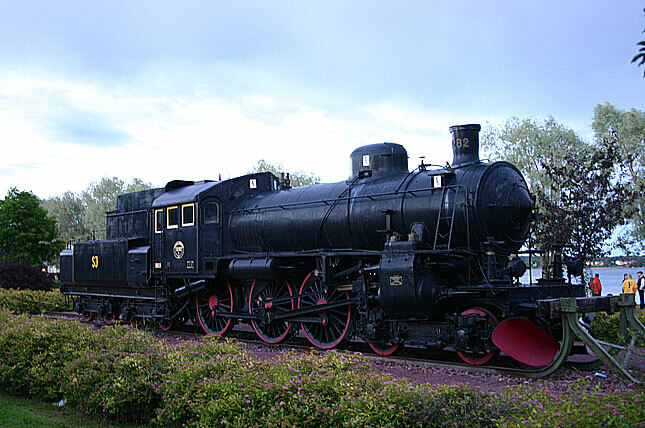 The engines were constructed for light rails on secondary main lines and therefore equipped with cylinders insde of the frame to reduce weight. This was quite common design on a number of privately owned roads but not as common on SJ engines. 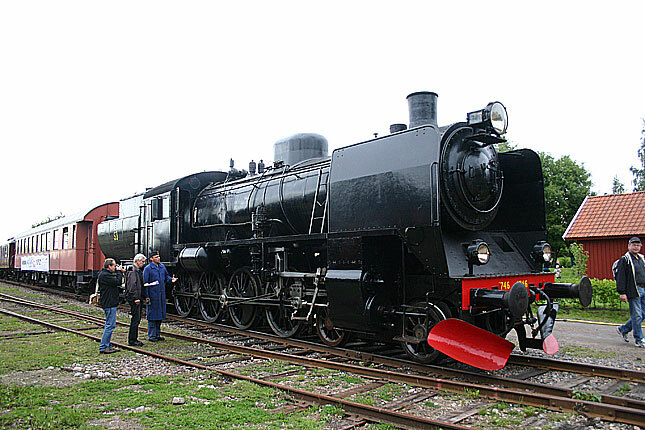 The second image shows the standard tender designed for these engines. 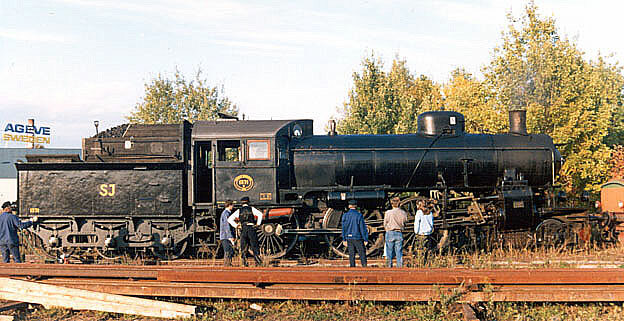 It was first used shortly on the A-class Atlantics from 1906 before the new 4-axle tenders were delivered, as seen on the B-class engine below. The demands of railways started to take its toll of the engines from the 19.th century and during 1906 an to the outbreak of WW. I, SJ designed their finest, first the A-class Atlantics were built in 1906 to easy the strain on the lighter CC-class engines. 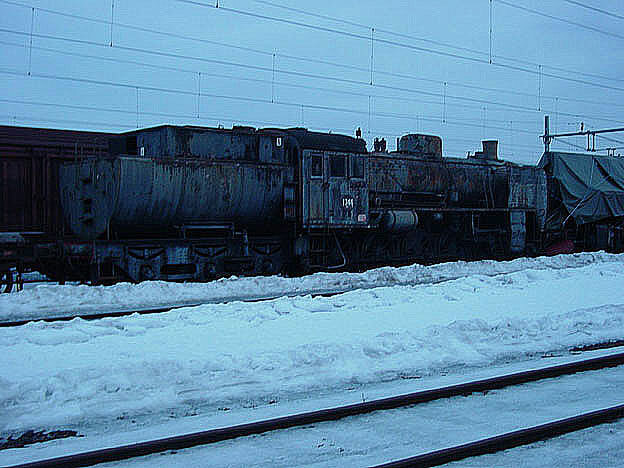 The size of the expresstrains had increased and it was common to see these being doubleheaded. B-class dual service Ten Wheelers arrived to the scene in 1910. This class, based on Prussian P8.s was appearently what SJ wanted and 96 copies were built. 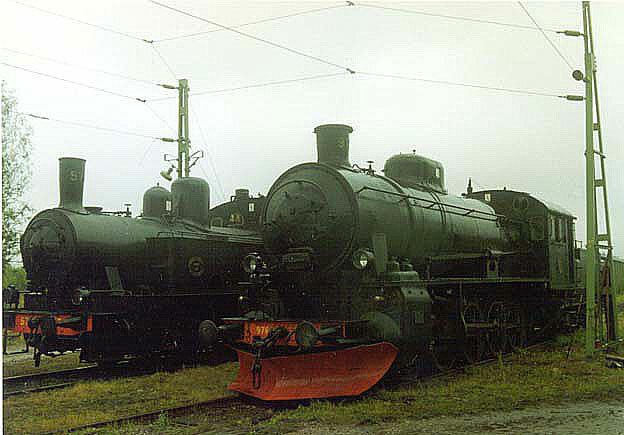 These engines saw dual service duties. From fast passengerruns to heavy freights from north to south. 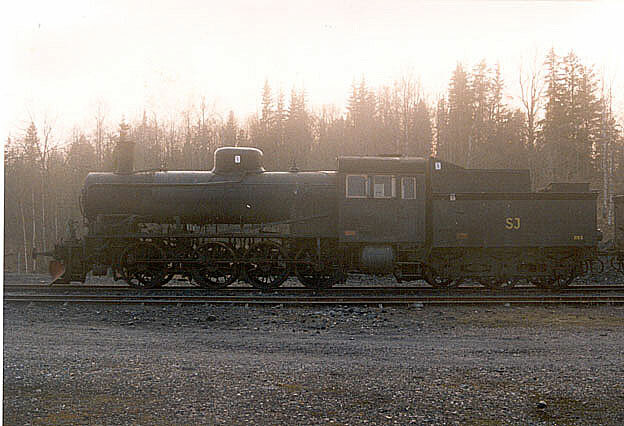 The B.s were so highly regaded the the private SWB ordered 3 engines of slightly modified in 1942 once the line was nationalized in 1944, SJ rostered 99 engines. 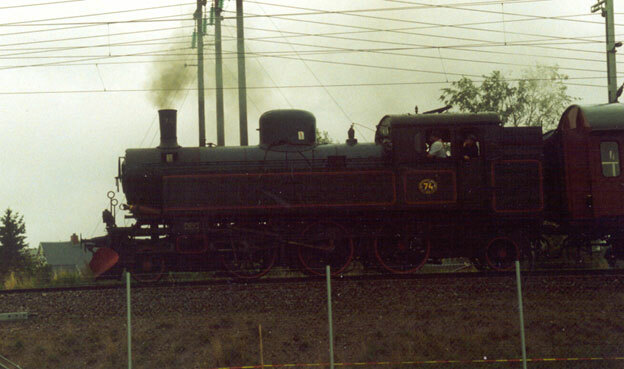 The B class were the dominating steam engines in to the very end of steam. 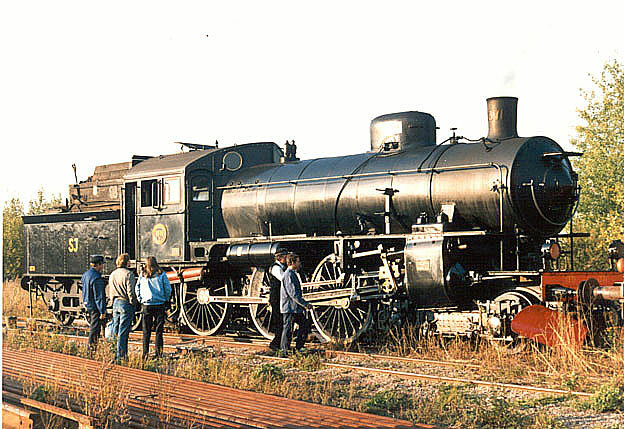 And many of the steamers are still around, making together with an E2 a standard issue in every standard gauge preserved line in the country. 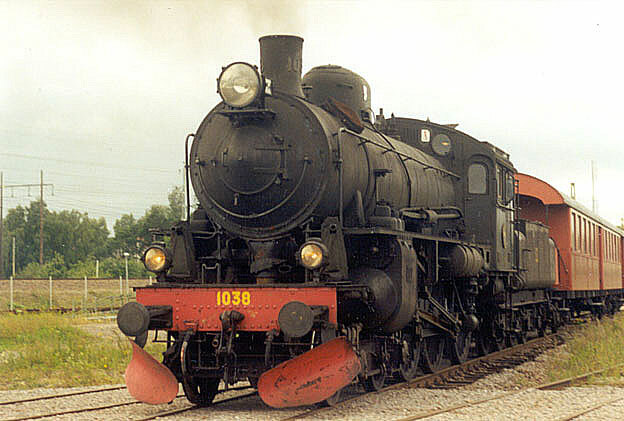 The 1038 engine is an unique, one of the few oilfired B-class engine under steam. 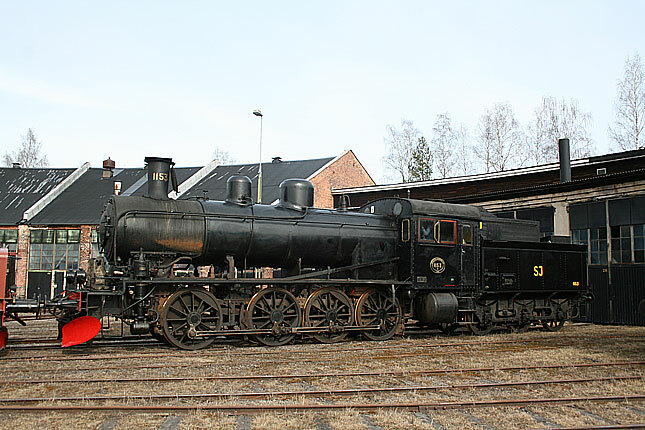 The other, 1281, is preserved in Grängesberg and coal fired. 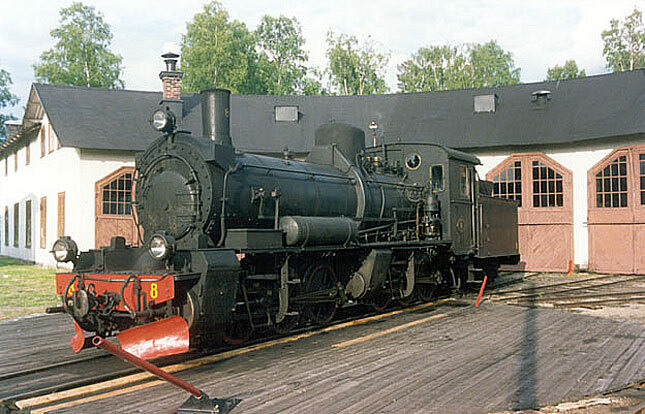 It is show time, well the handsome Ten Wheeler B 1135 is fired up during open house at GDJmf which is housed at the twin roundhouses in Falun. Falun 28th of August 2006. A couple of extra shots. 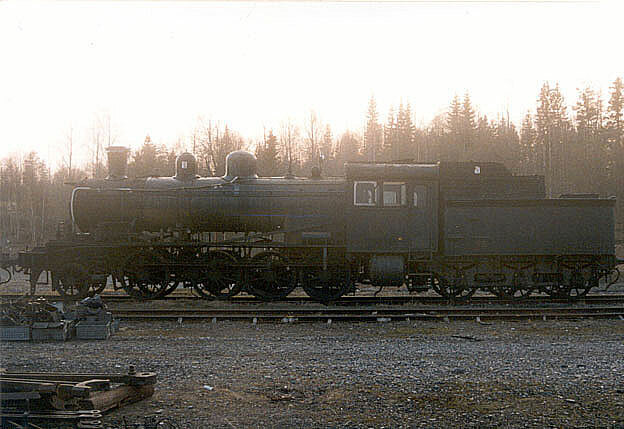 SJ B 1317 in Sveg. It seems that among some of the preserved groups has a least to say a vaining interest. 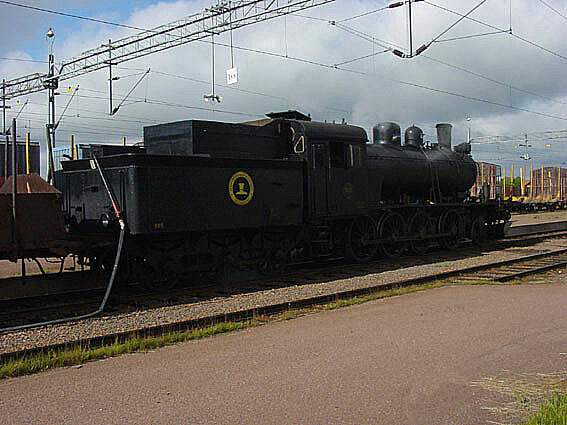 This B-that has been repainted to some sort of original colors and had a highlight of carrier to be one of the steamers that were used on the main parade of 125 anniversary of the Swedish national railroad in Stockholm in 1981. Today, it seem to need a bit of attention. 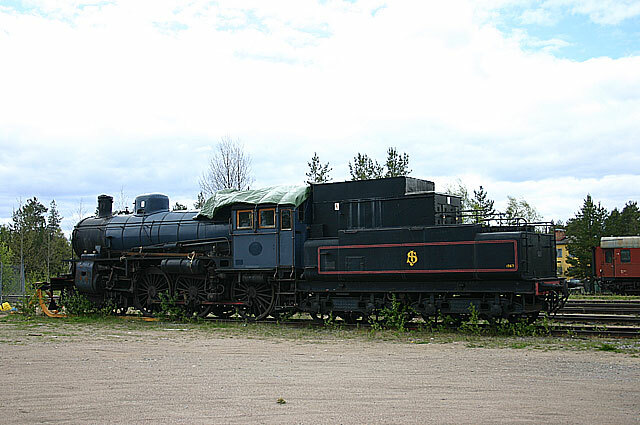 Once one of the headlights in SJ.s parade of historical trains, now sitting idle and appearently own by people of disinterest as it resides in Sveg. B 1347 is perhaps looking for a new home. Sveg 6th of June 2005. 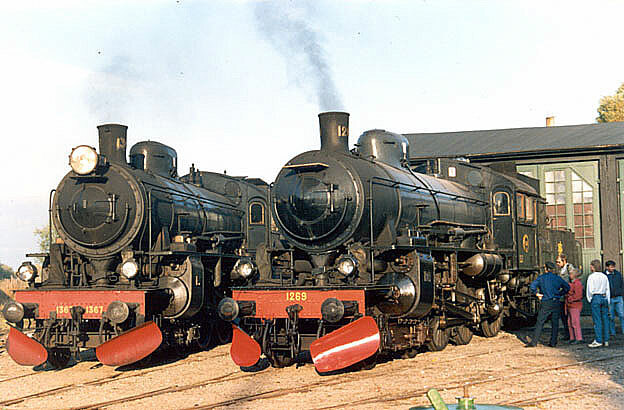 B-class engines are handsome don't you think? specially when under steam at a platform. 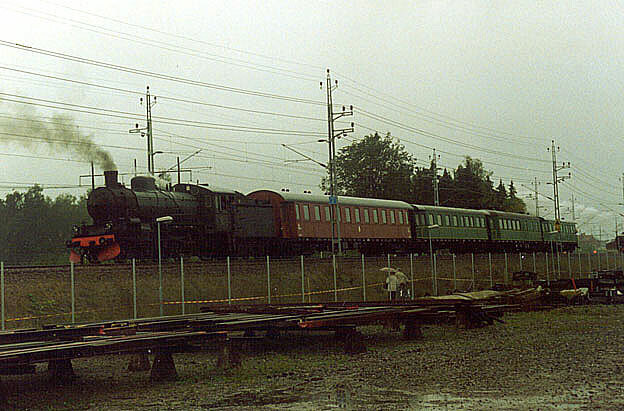 This railfan excursion consist of steal cars from TGOJ in their orginal green livery, gives a clue of the postwar scene in Gävle. 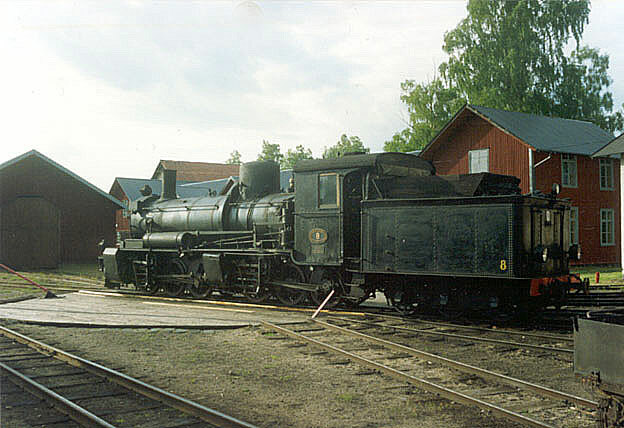 Not all the remaining B-class engines are under the steam, like this engine, put as a display in Mora. Mora was a junction where the Inland line met the route to the east coast or south and aswell for the Älvdalen line branch. The second picture taken in 8. 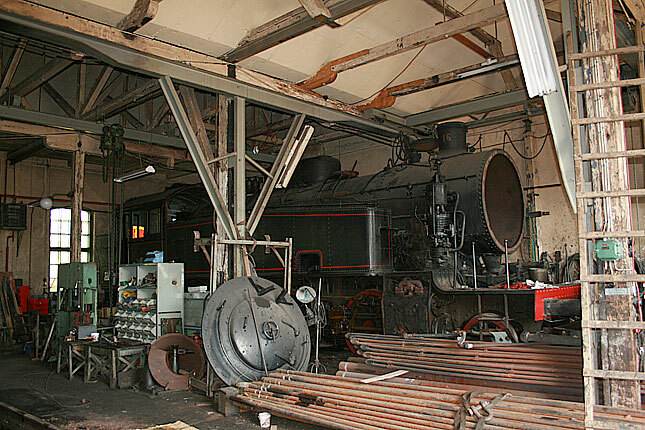 August 2005, shows the engine from the other side. 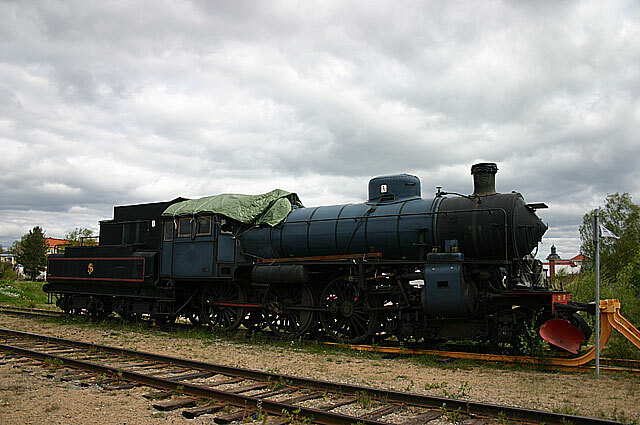 This engine was built by SJ but sold in 1936 to the private line SWB as their class A, later A2 when modified Bengines of A2-class where built in 1943. 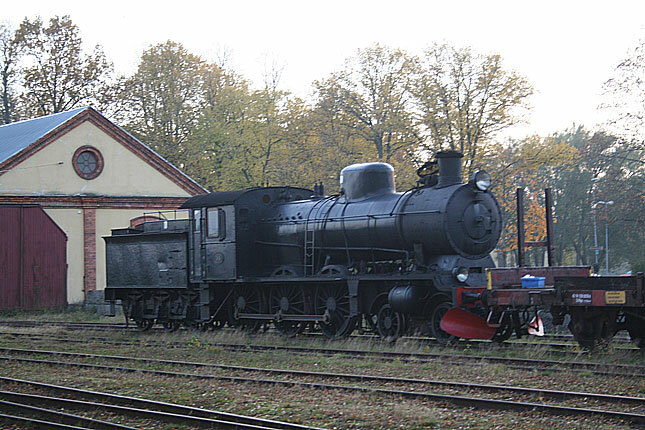 The engine was modified with 3 axled tender and is now waiting for her restauration in orsa. 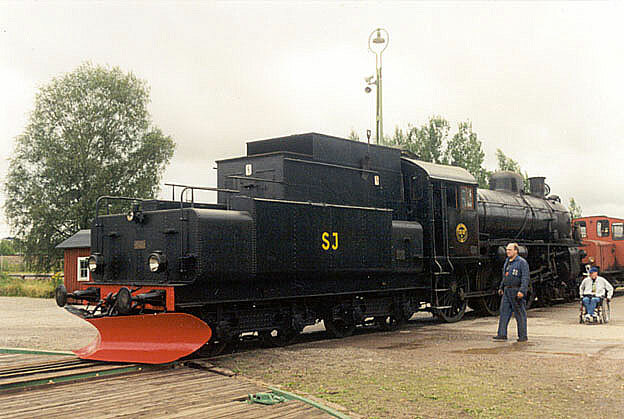 The engine is now owned by SKÅJ. 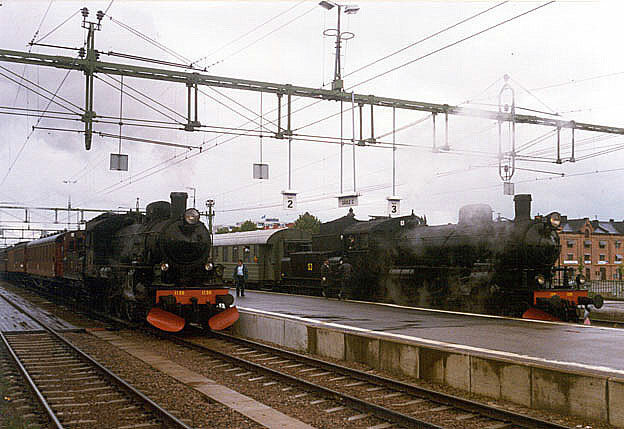 A photo run by with an excursintrain outside the National Railway Museum in Gävle with double heading B-class engines with B 1269 on front. Anither runby with an unidentified B class engine, this time with a cut of logcars. As mentioned some engines received in time a 3-axle tender to make them able to be turned around on some lines with smaller turntables. 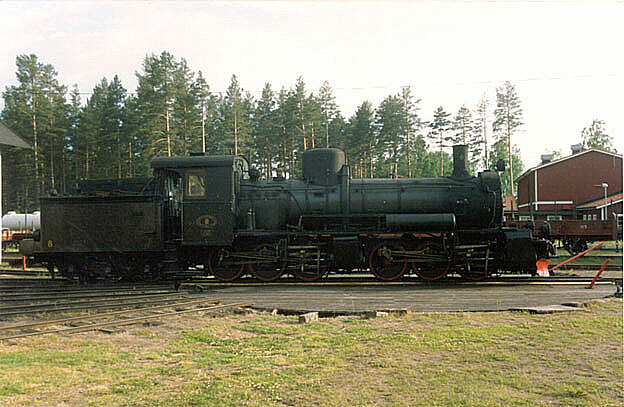 One such is this unidentified B in Gävle. 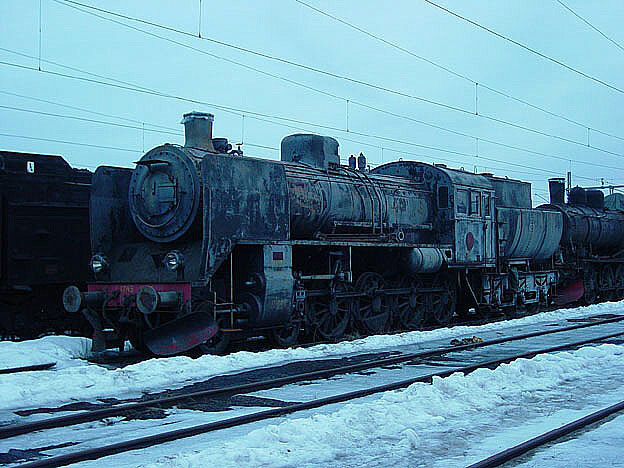 The last three of B.s ever produced, the former SWB engines from 1940.es received another type of three axled tenders. The tenders on A and B classes are rather unique in design... 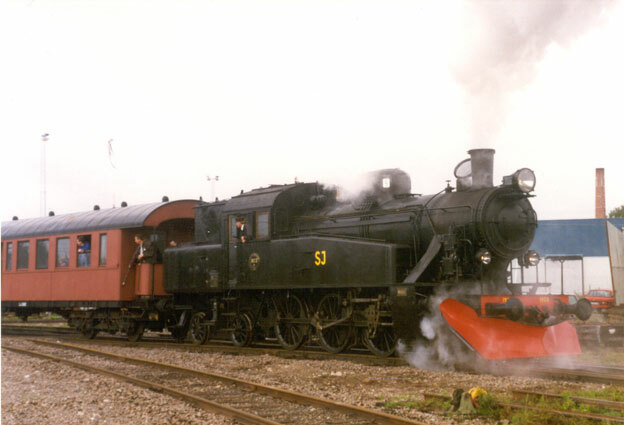 The A class orginally were coupled to a standard 3 axle tenders as the new tenders were not yet available. 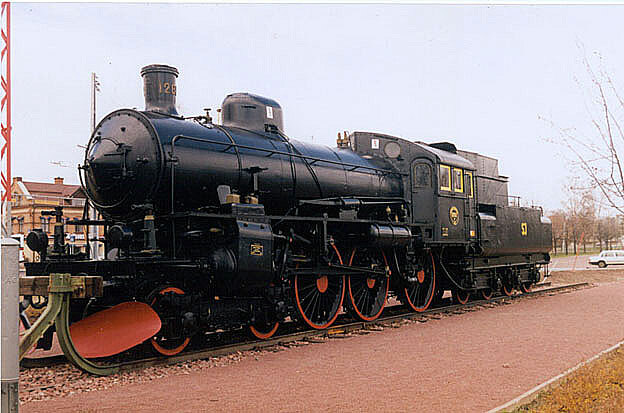 B-class engines saw long life in service, many were also modified to the demand. Most common was adding a 3-axle tender to suit the turntables on some lines. 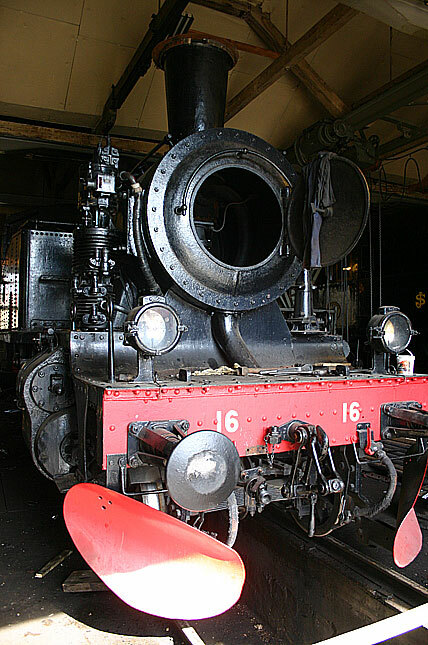 During the both World Wars, the engines were converted to woodburners with new stacks. 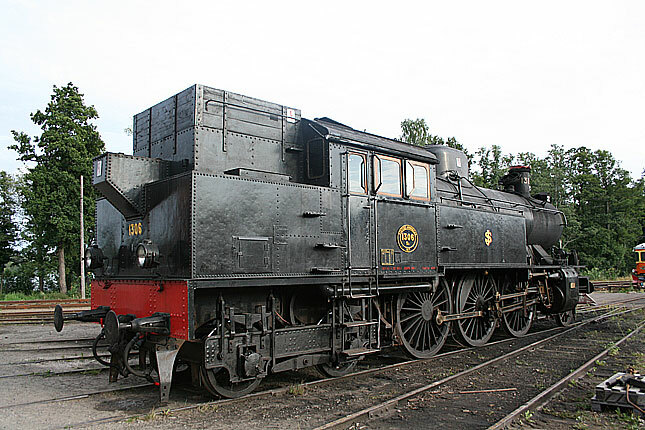 Once the availability of the imported coal improved the engines were modified back to their normal apparences. 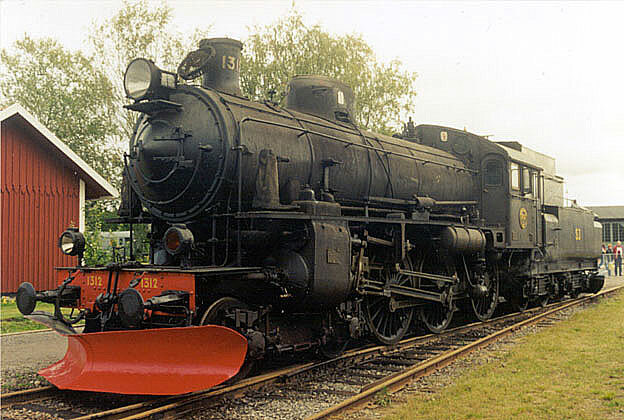 This engine seem to have spend most of the dys in north as witnessed by special snowplows on both ends. The engine sports a tender of orginal design. 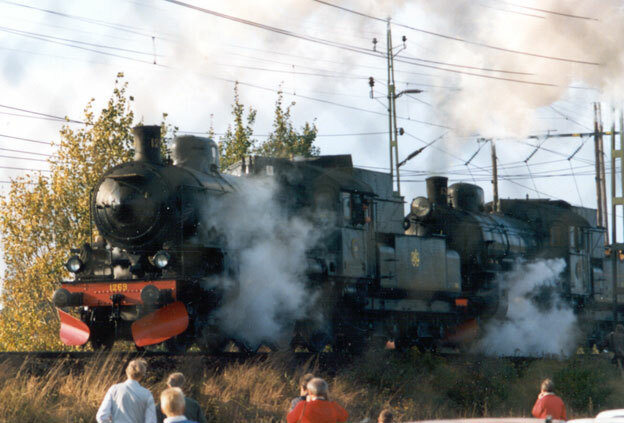 The largest and the most handome steamers were the only Pacifics in Sweden, the sleek and majestic F-class that was the ultimate power on the express trains before the mainlines were electrified in the 1920.s and 1930.s. 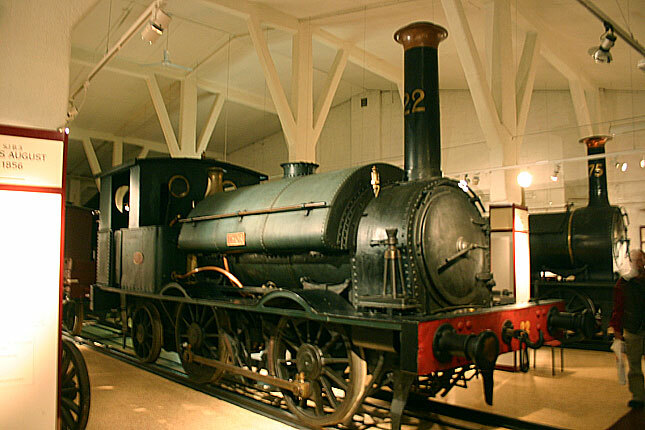 The F-class was the next generation of modern superheated power for the expresstrains and in many cases repalced the Atlantics from 1906, the A-class when the tonnage on express trains in creased. 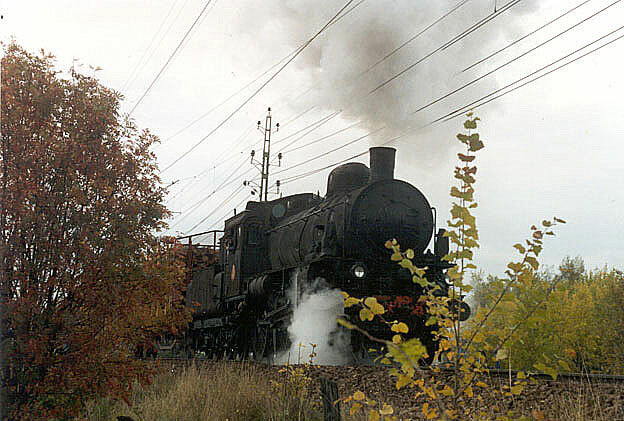 Two of the last steam engines designed with the iron ore line in mind. 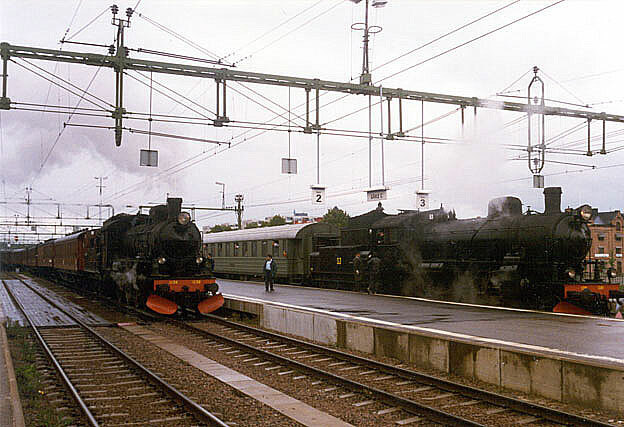 The next generation were electrics... To the right the most powerful of all swedish steamers the 0-10-0 R-class, which are together with the only Swedish Pacifics of F-class considered as the highlights of Swedish steamers. 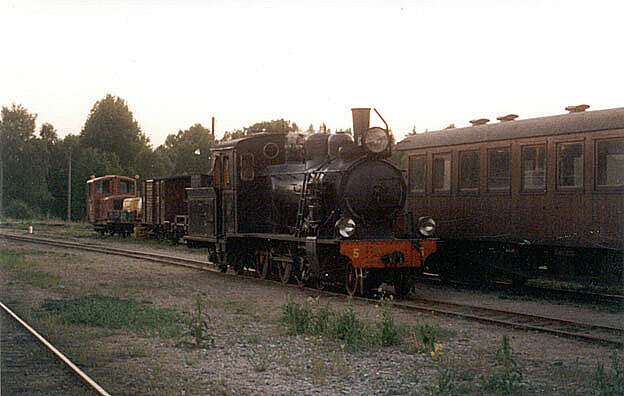 To the left, the tankengine is 0-8-0T N-class used for switching on the line. As the iron ore electrification was a success, the designs on steamers came allmost to halt. And the mainlines were elctrified during the 30.es all the way to the end of WWII. 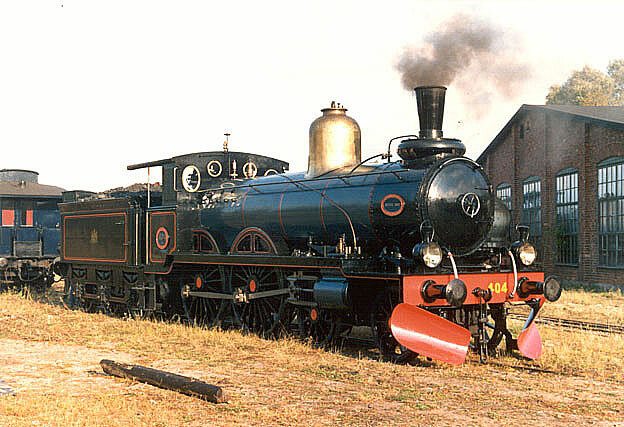 The only steamers designed was mostly based from the designs from the 1910.s albeit greatly modified, but in rather moderate on size and numbers. 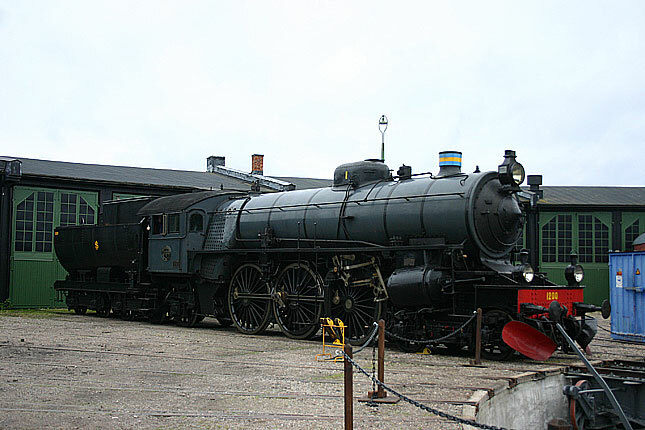 A R-class in steam is as impressive and rare sight. 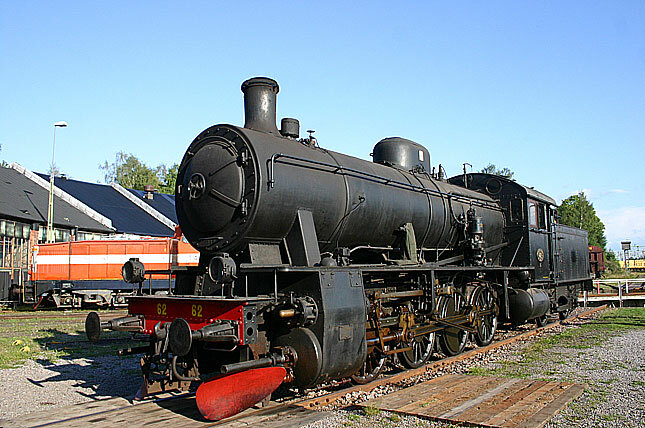 The engine class of 3 engines were the sole steamers in Swedish standard gauge with 5 driving axles and was the heaviest pullers aming the freight engines. One has survived and was not only in steam but running a freight with a pair of Da-class electrics as pushers. Gävle 2009-09-12. No, it is not a winter camuflage, it is weathering. 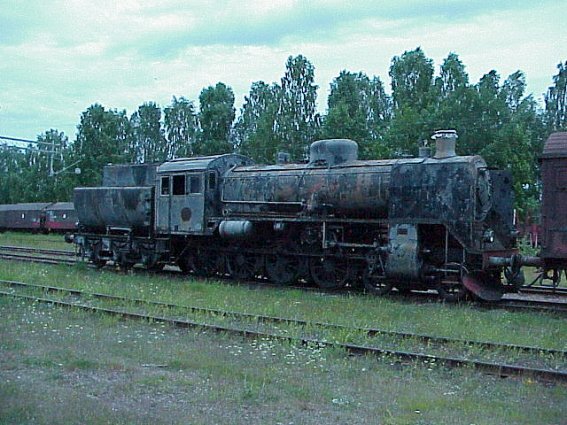 This pair of E10.s in Grängesberg is indeed a sad sight. 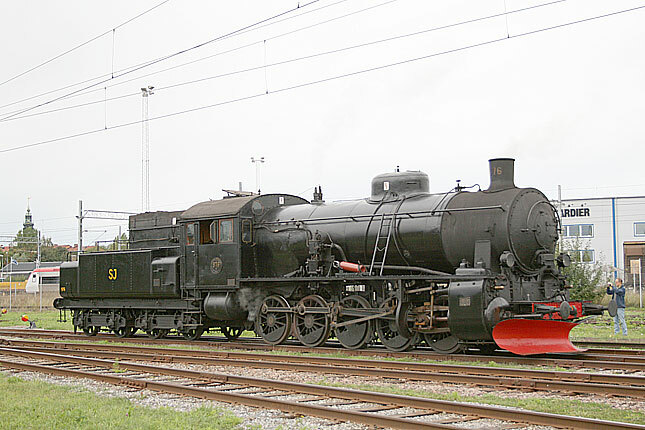 The E10-class 4-8-0.s are the last swedish tender engines dating from 1947. 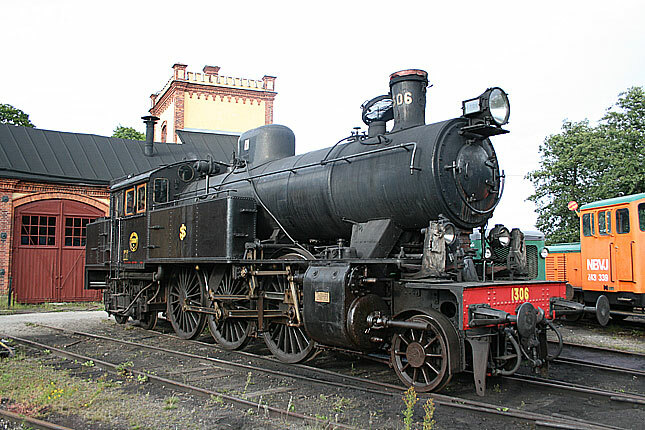 Loaded with modern steam features but being oil fired and despite their good looks not popular among Swedish preserving groups. 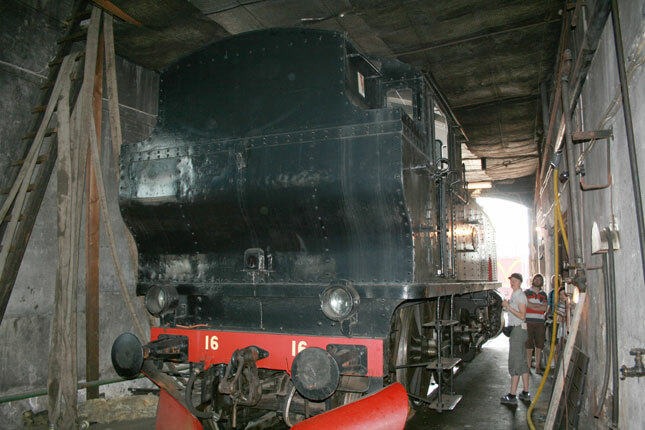 The engines were used on the Inland Line during the late fifties and were replaced by T44 only a few years of service. This E10, seem to have more certain future as it was added to the roster odf a new rail preservation group located at Orsa. Photo in Mora in late may while waiting for the final transfer to Orsa. This finalized in June 2004. 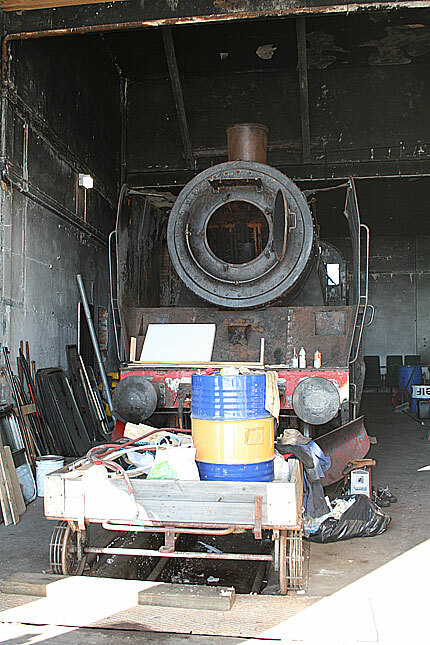 In 2009 the engine is waiting for her turn for restauration in the round house of Orsa which is now houssing an interesting mix of historic engines and rail cars. Orsa 2009-04-03. 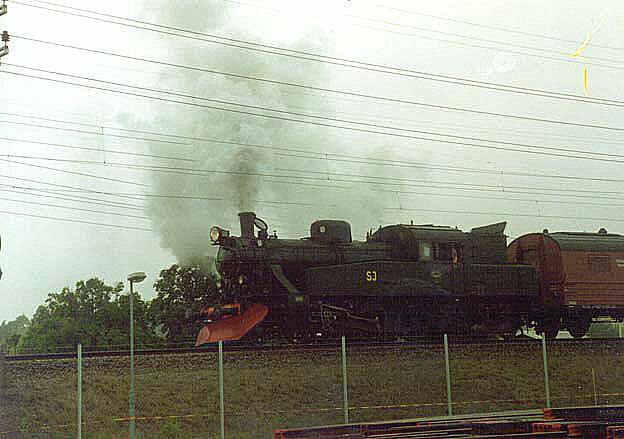 Along the B and A6, the E10 is one of my personal favorite engines. 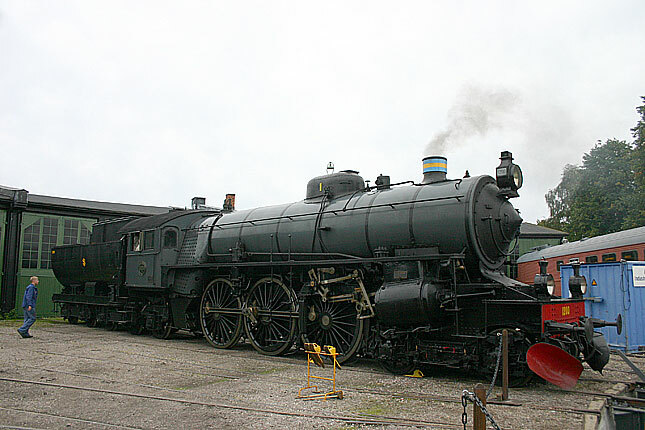 Constructed in 1947, based on ex private E9 class 4-8-0.s these engnies were modern counter parts of them. 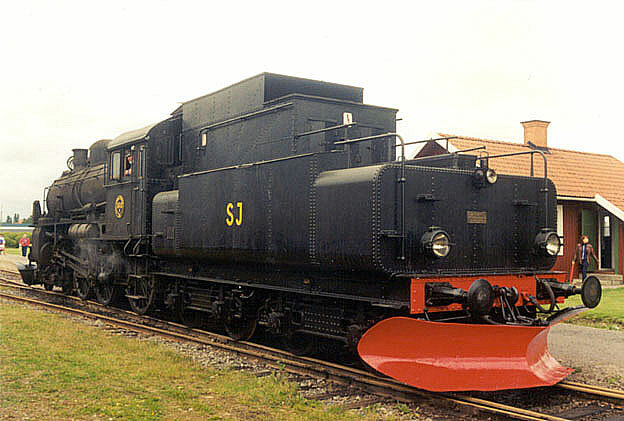 They were unigue in SJ history as being the last tender engines dating 1947, being the only three cylnder powered engines ordered by SJ and all were wearing smoke deflectors from start. 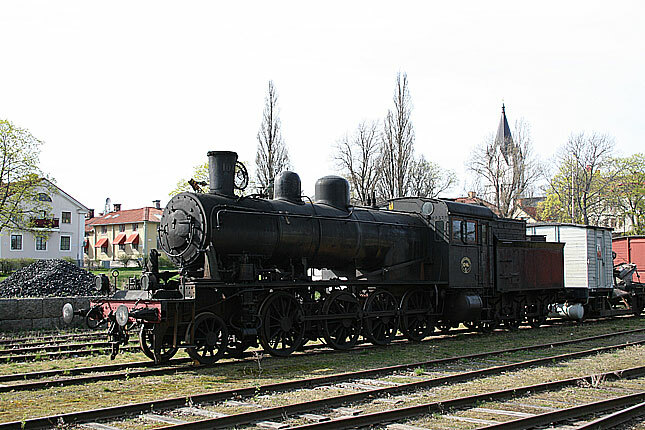 10 engines were ever constructed and they were used mostly on freight service but did haul heavy passenger trains on secondary lines. 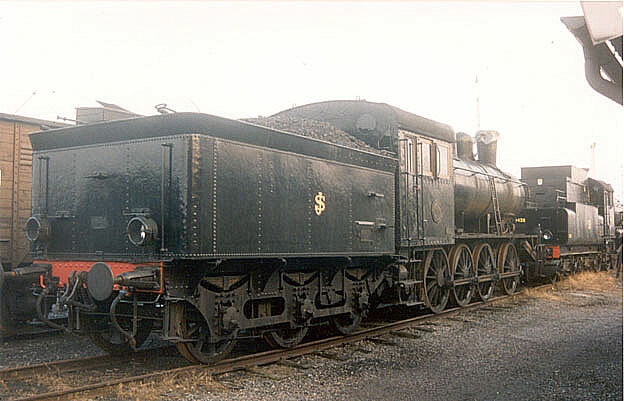 The end of steamorders came in 1952 as the 2-6-4T.s of S1-class were delivered. 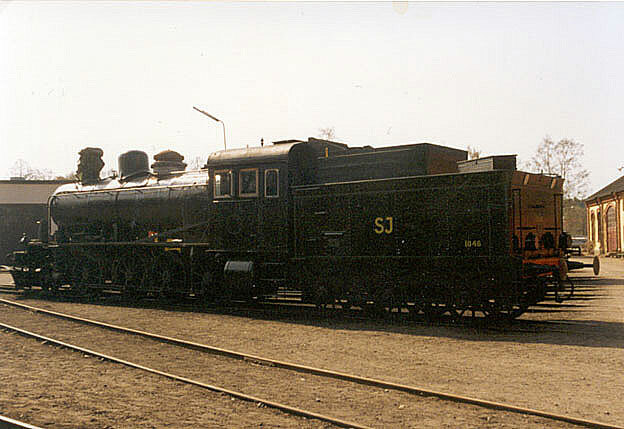 based on earlier design of Sb-class (later S2) the engines proved to be soon outdated and the crew who had a chanche to operate with S2.s prefered the older engines. 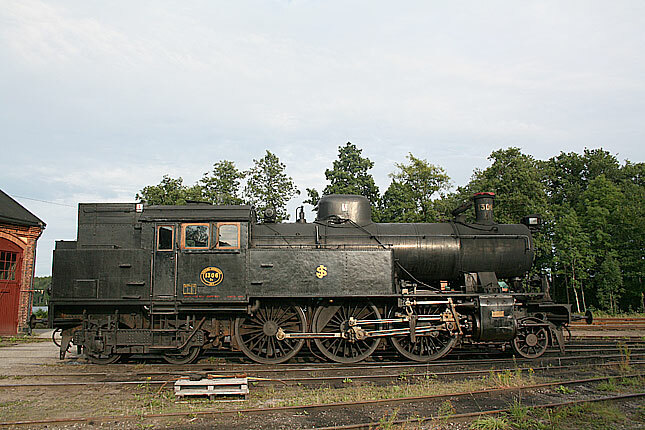 The postwar steamprogram besides S1.s consisted of a handsome 4-8-0 E10.s, and 2-8-0.s on 891mm and 1067mm gauges to replace a motly secetion of older often odd steamers. 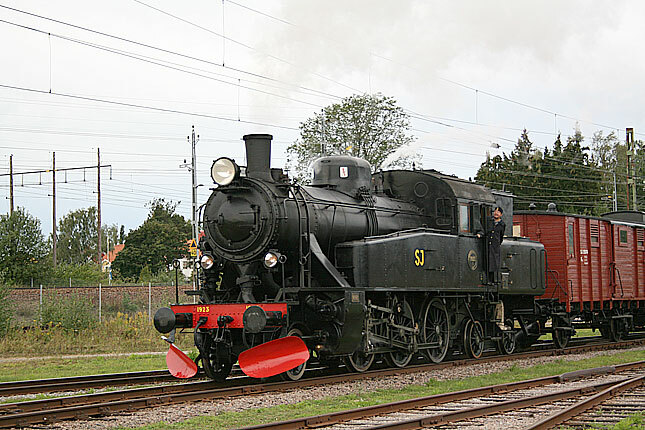 The classification for the narrowgauge Cons were Gp for 891mm gauge and Gt for 1067 mm. 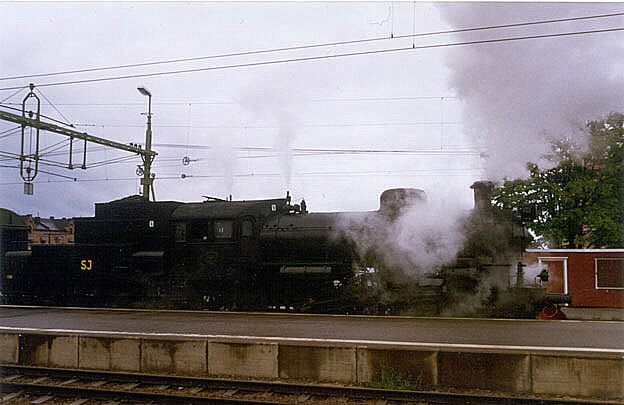 To see steam in modern date on SJ rails is quite uncommon. The best way to catch this scene from the past on SJ is to visit the railfan day weekend in early fall. 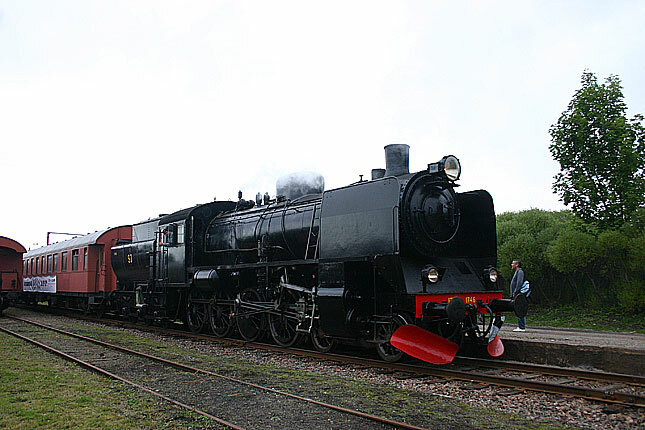 Most of the steam is provided by special trains provided by the various preserved railroads and preserved groups. 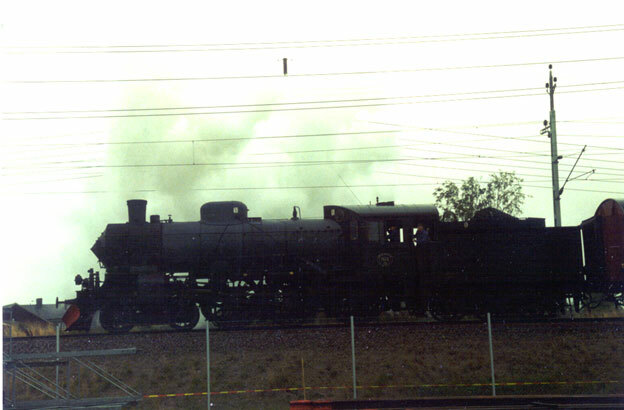 Photo of the 1923 is dating from such occation in 1996. 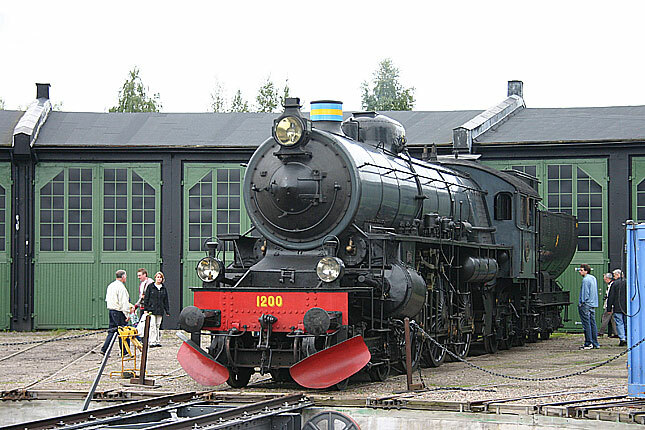 One of the popular events is the open house of the National Railroad Museum in Gävle and it hosts also shuttle trains, usually of various vintage from the central station to the museum area which is loacted in former engine service area, featuring two roundhouses. 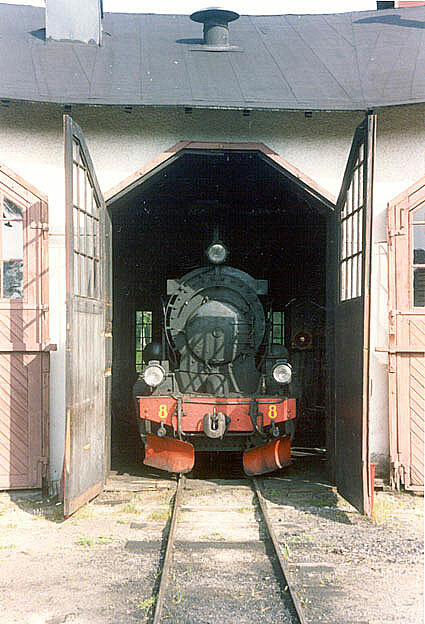 Todays power on the shuttle train consisting of 1890-1900 era cars is the S1 1923, which was boult much later in the early 1950.s. 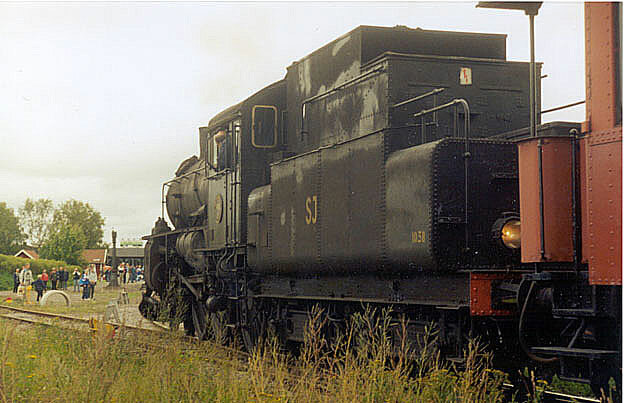 One of the most famous or at least most photographed steam angines is this Sb-class 1306. Nuch if its fame is based on that this was the National Railroad Clubs excursion train power and during the 1960.s to 1980.s. The train was seen occationally allmost everywhere in the country. 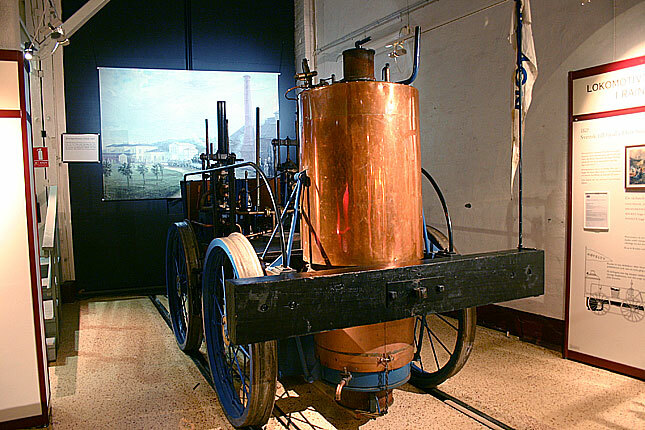 Another reason for its fame is that Tendshodo made a brass model of a Sb-tank which is a highly prized for collectors. 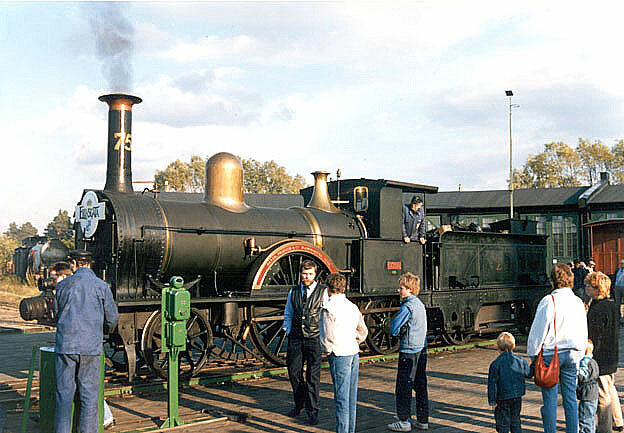 The Sb.s were not many in number in scale 1:1, only five were ever made of this very handsome 2-6-4T. 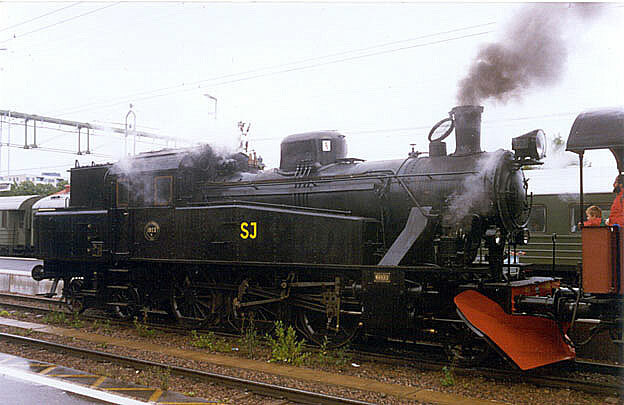 In the 1950.s when S1-class was introduced the Sb.s were reclassified as S2-class. They hadleded passanger runs aswell freights and even in switching. I guess everybody has their favorite engines as this I guess is mine Before the WWI the private line SWB adopted the their allied private lines design of a fast 4-6-0 passanger steamer. With slightly smaller drivers and straight smoke boxed they turned out to be a success. 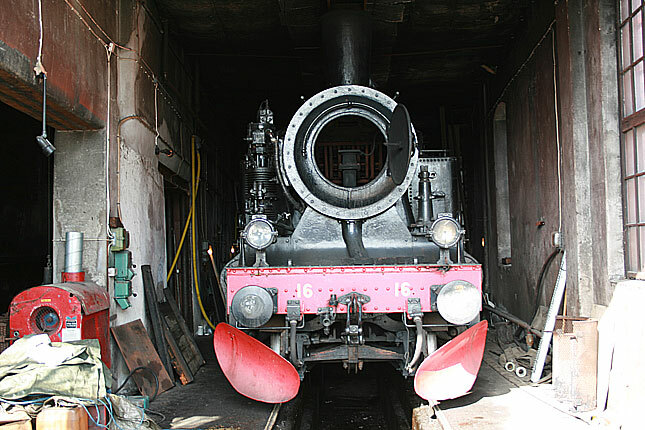 Later to releave pressure of smaller engines the company shops constructed from spare parts an addtional engine which was given the number 56 as there was a n empty slot in the roster after not as successful class was withdrawn. 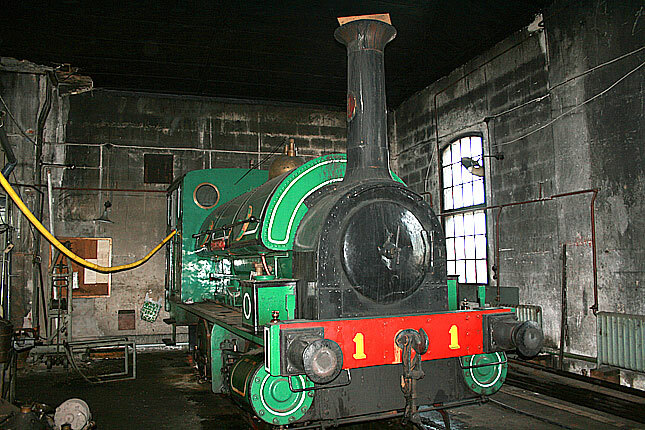 The preserved line in Nora has two of these SWB engines, which were altered much within time with smoke driving plates and relocated rubbing boards. 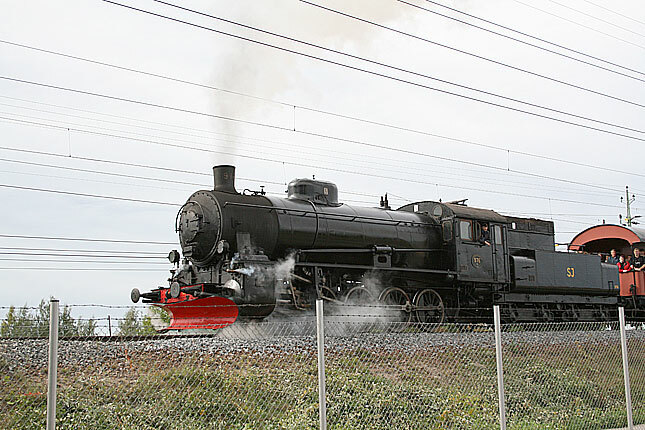 The SWB H3 56 is shown in pretty much in same appearence as it left the shops back in 1931. The other SWB on the line is H3 58. Gävle Dala Järnväg from Gävle from the east coast over Falun and within time eventually to Mora. 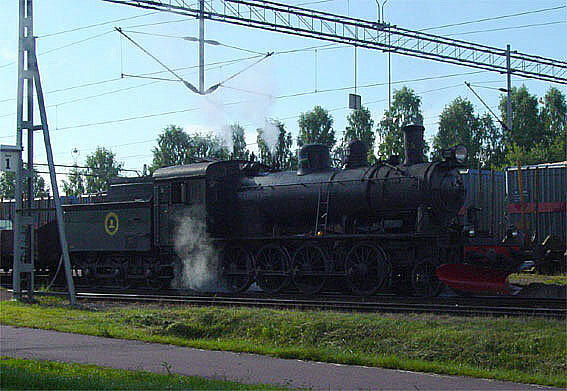 The line sported some of the toughest grades just south of Rättvik which employed, after the line was nationalized the heaviest steam engines in the country. 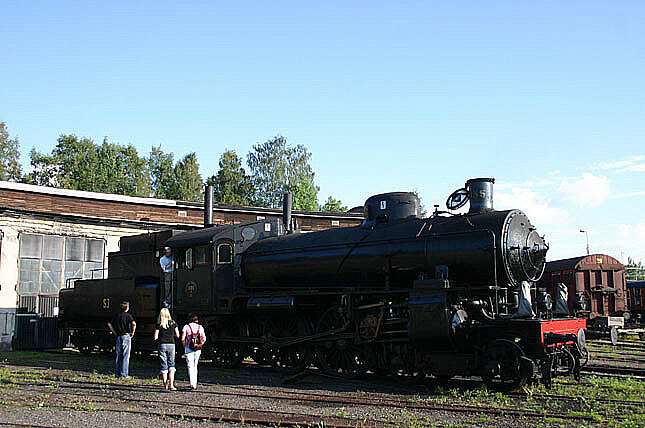 But the engines empolyed by the original line were no midgets as this three cylinder super heated 0-8-0 built in 1928 which is preserved and parked at its home in round house in Falun during a open day in 28th of August 2006. 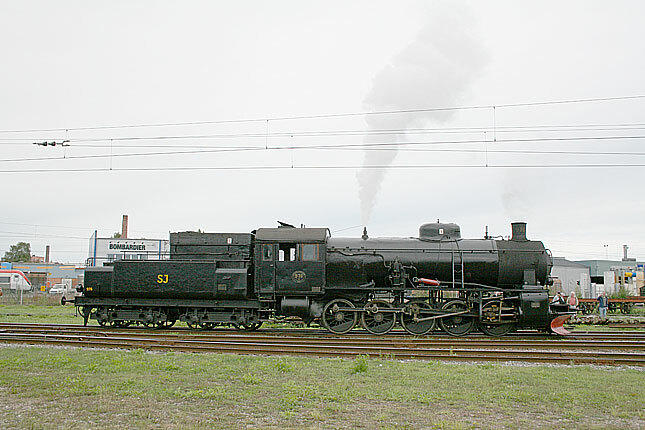 The elegant 4 cylinder engines of B4-class were constructed to the private Uppsala-Gävle line and only 4 of them were ever built, the line itself was nationalized as one of the early private lines and these engines were sold to another private line SWB. 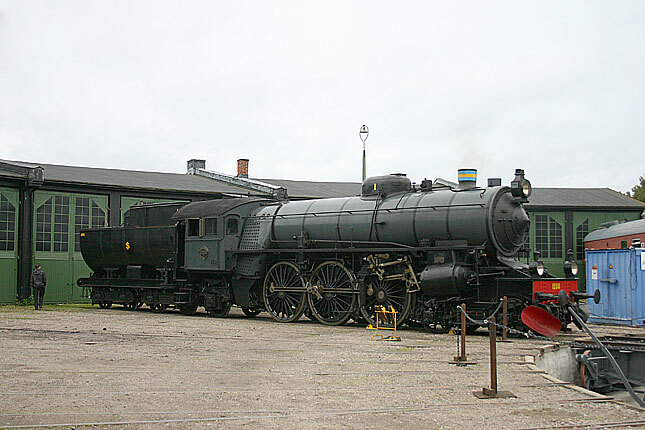 In railroad tradition in Sweden dominated by twocylinders, they were considered as orphans and sold to the privately owned SWB, which was nationalized in 1944. 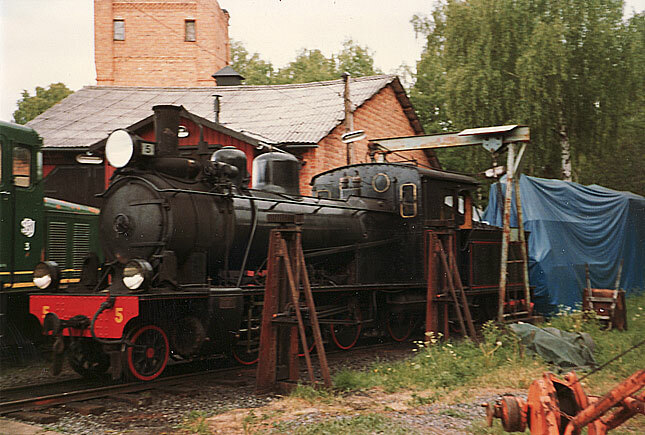 The sole surviver is seen on a photorunby in Gävle in the early 1990.es. 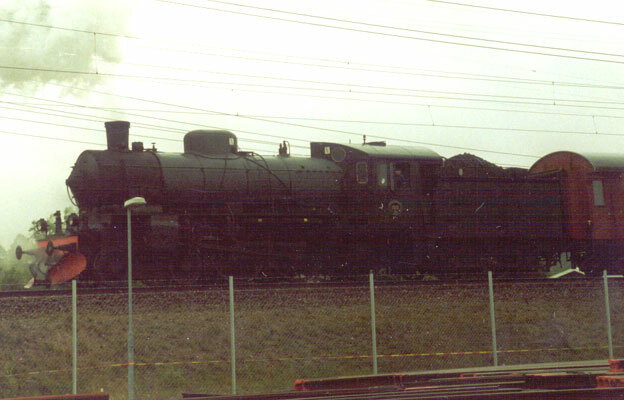 There it hauled a consist including some of the earliest steel passenger cars repainted in to bright green orginal OKB-paint. The largest of all privetly owned lines was Bergslagarnas Järnväg. 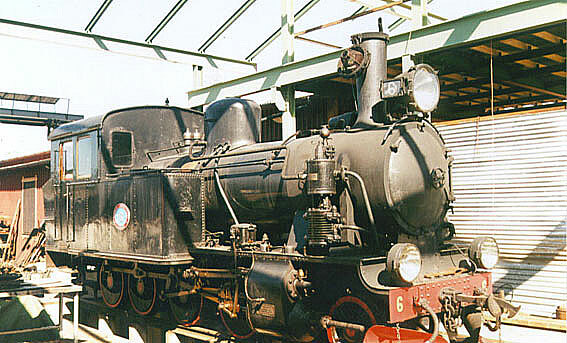 The line designed a number of interesting engines as the 2-6-2T Y3-class. SWB was one of the largest private compaines and was for a while allied with BJ. SWB took a hard look on the BJ.s Y3,s ad desigend own ones that was at least inspired by them. 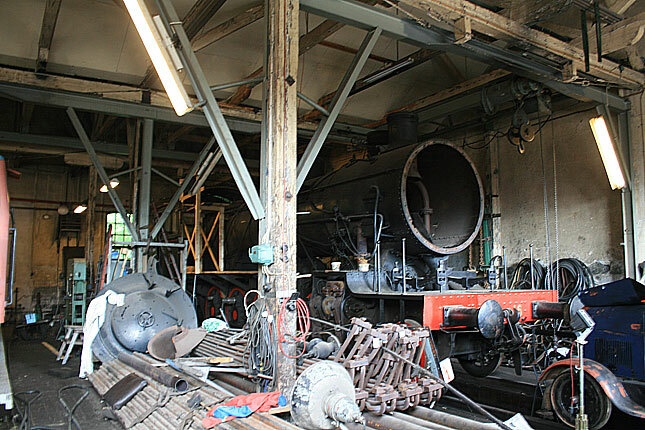 But in appearence they receibved a bit rounded forms which was even more rounded as the added size of the coal boxes during the earlier years. Nora 2007-04-13. 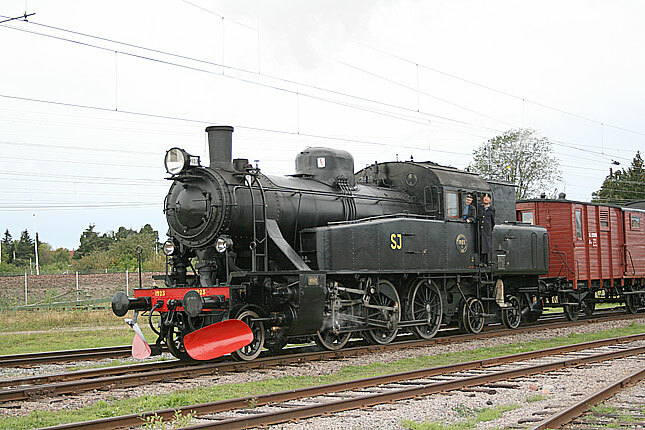 One of the most succesful and the largest group of engines on former SWB was the Y3 class 2-6-2T and 14 engines were built between 1909 and 1918. 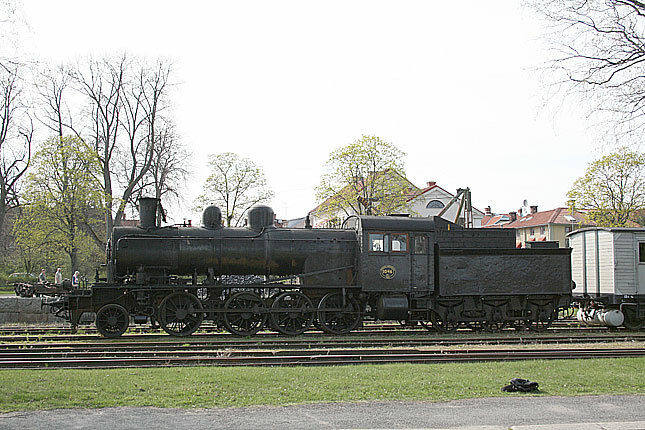 After been withdrawn from roster of SJ as the line was nationalized in 1940.s, the city of Sundbyberg bought the engine and put it on display. 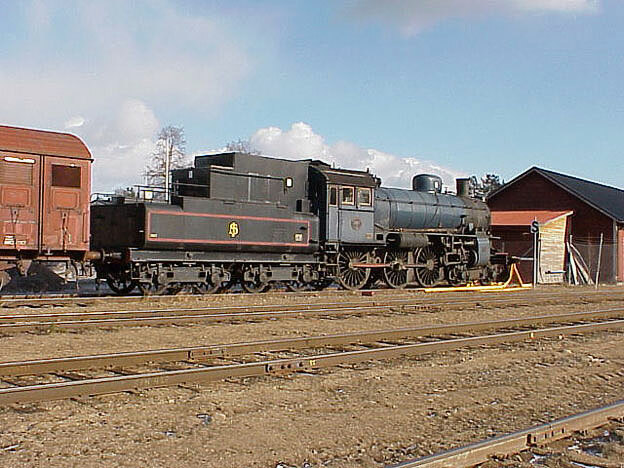 Now tghe nigine is part of NBVJ in Nora where several other ex.SWB engines are located. Nora 2009-05-02. 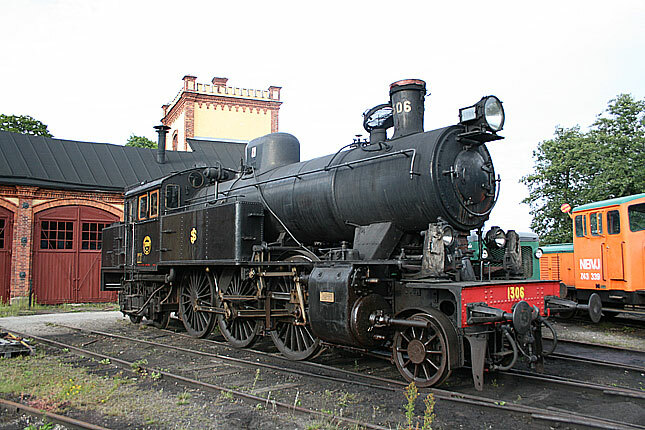 In Sweden steam engines never got really big but among the heaviest tank engines was this engine, NBJ 16 which was the very last engine rostered as active by any railroad in Sweden. It has never been in other ownership than in NBJ and even today it is sitting in the very same round house as it did as it arrived new in 1928. Nora 2009-05-02. 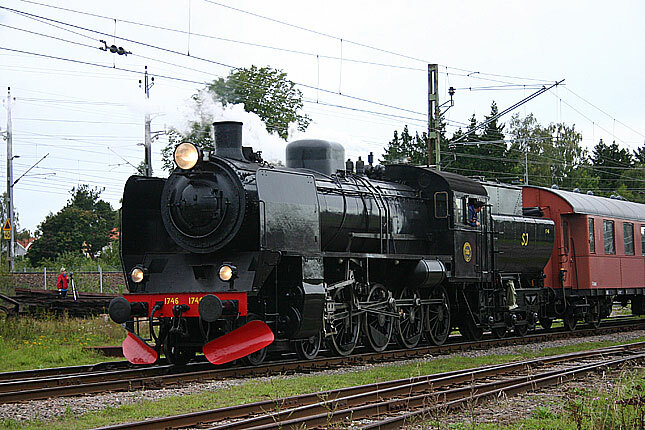 You could easily believe that the photo of the big Mikado tank engine was shot at the same occation as seen above. 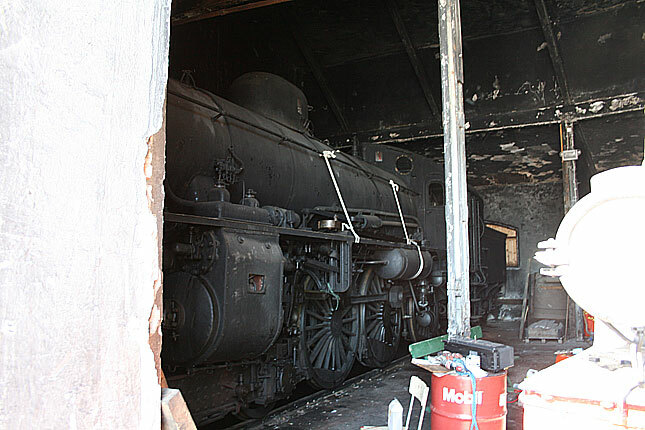 But steam restoration does not come cheap and requires a lot of skilled labour to finish the project. 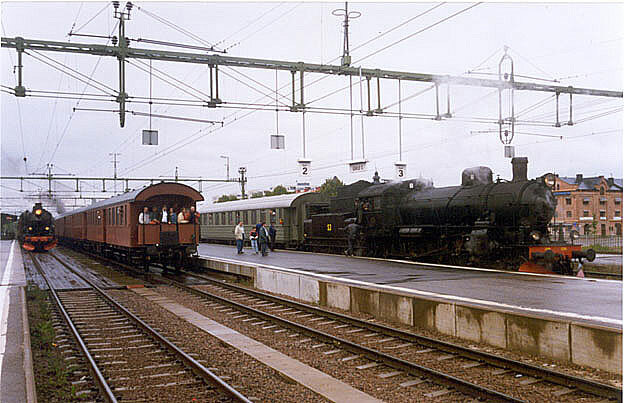 Swerden had 7 lines on the 600mm gauge that were common carriers, most of them were rather short, though one was located in city and was in many respects run as a suburban train and later rebuilt ot standard gauge electric interurban line before absorbed in to the Helsingborgs city tram network. 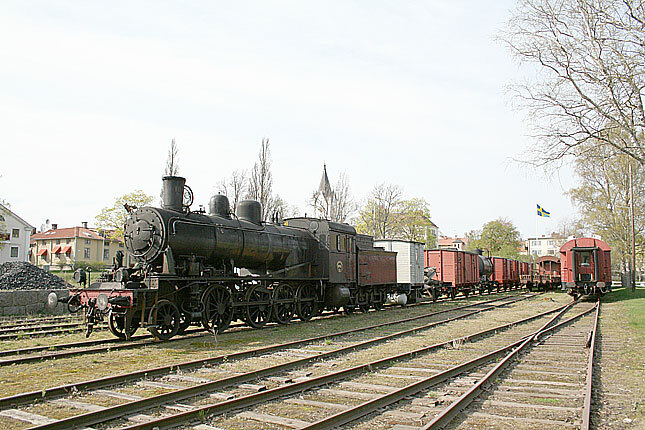 The longest line was NAEj, which was about 40 km long and the biggest poer was this 2-6-2 which was a behemonth on the narrow light rails. 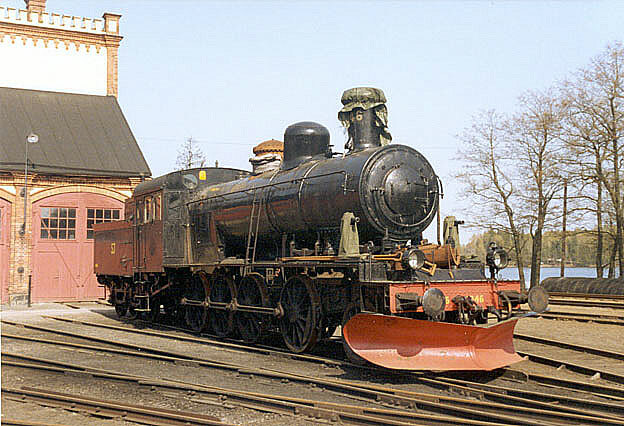 This type of engines saw service on JGJ too and its engine number 9 is not only a sister engine to this here but also preserved on the 600 mm museum line at Mariefred. 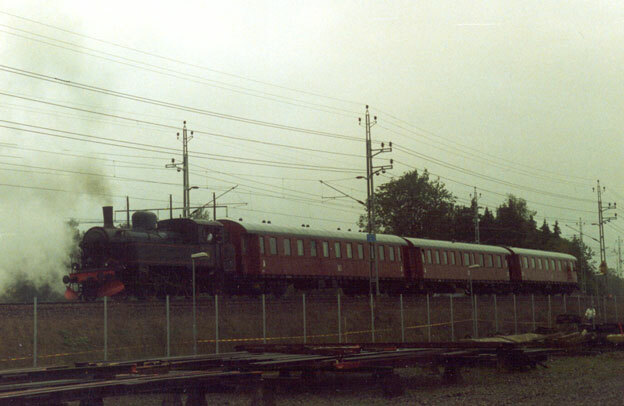 The Swedish railroad net was in the beginning rich on various privately owned lines from 600 mm gauge to the standard gauge. One of the most interesting was a ore hauler that turned in to a loghaler, sneaking its way from the forrested eatern foothills of Dalecarlia to the giant paermill on the east coast. 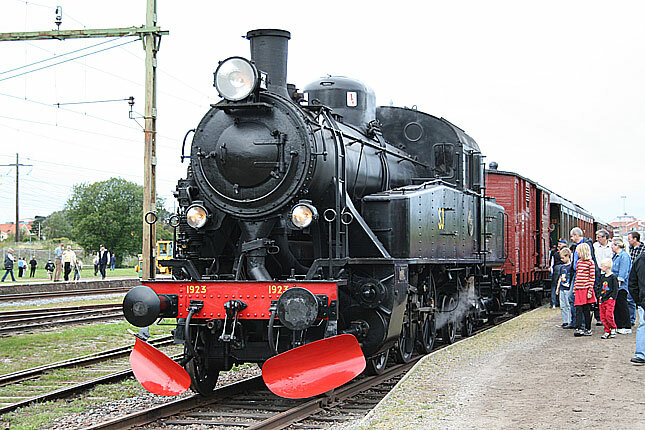 One of the nost intetersitng feature on the line were the three 0-6-6-0 Mallets #1, 8 and 12, they are by far the largest articulated steamers in the country and the two of them are running to day on a 5 kilometer long protion of their former mainline around the operation hub of Jädraås. 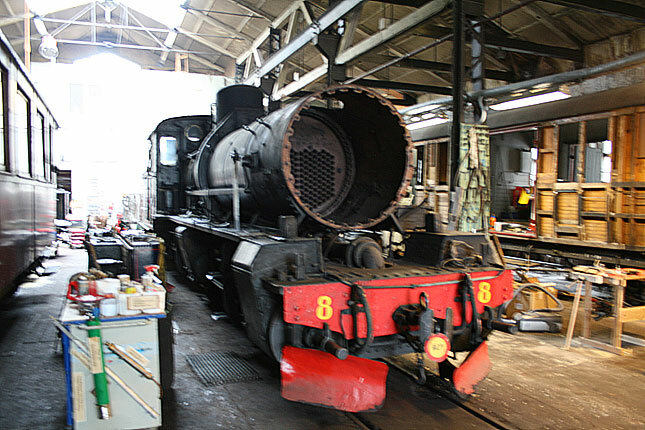 Now adays the DONJ 8 is waiting to be back on the rails on its own power as it is shopped and waiting for a new boiler. 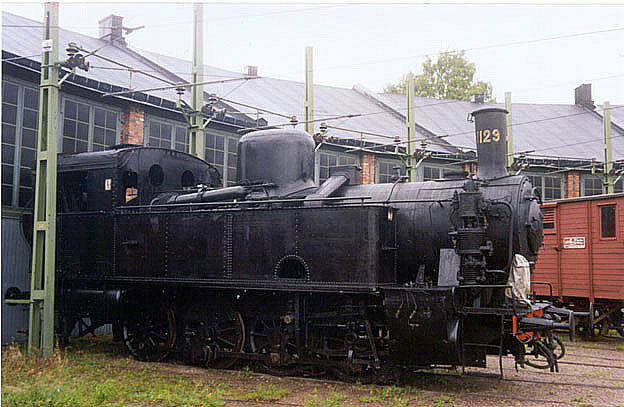 Its sister the number 12 is also in need of some attention but is used sparsly on line. 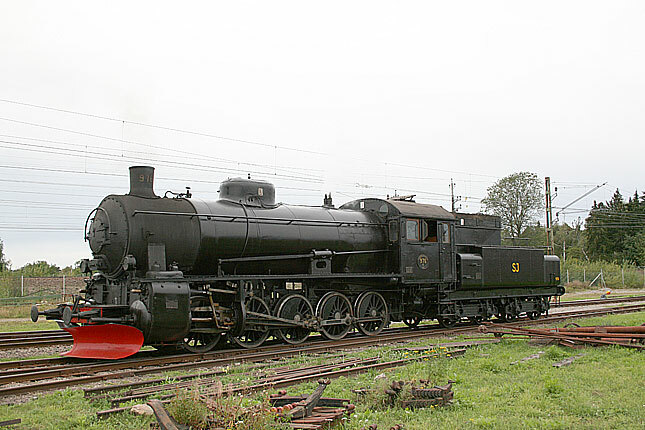 The Falun made 891 gauge 2-8-0 BLJ 5 Thor is the sole survior of the class that were sold to several railroad. Besides the mallets shown above DONJ these Consolidations were the backbone in loghauling untill the diesels came to DONJ and the last of them were scrapped in early 1960.es. 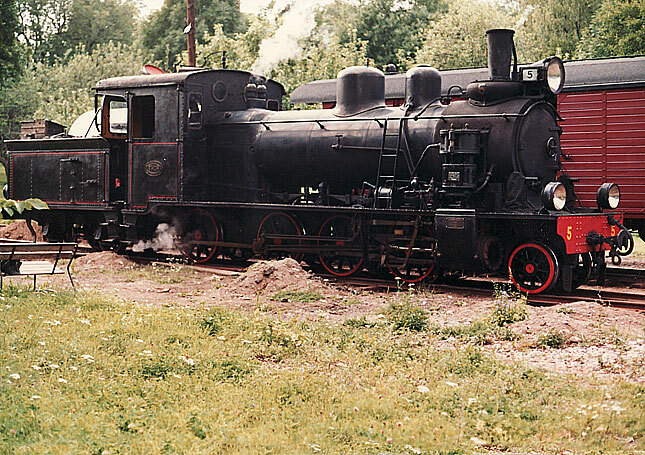 The vast narrowgauge net north of Stockholm picked one engine, which very close to Thor, except it rode with a three axled tender. The Thor and its DONJ sisters made it with 2-axled tender. BLJ, was an interesting line where handbrakes were used to the end of operation in the 1960.es. 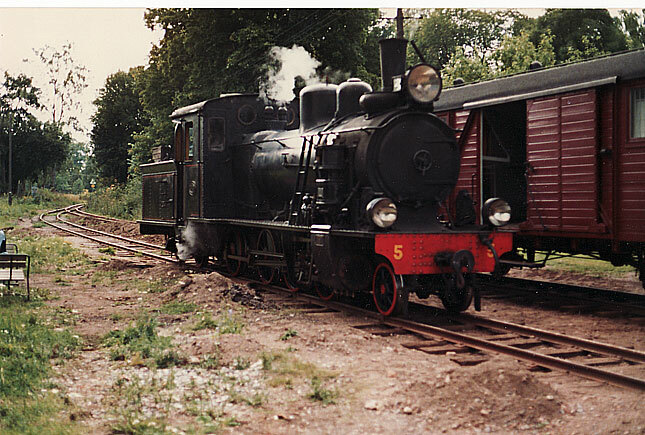 Thor shared the roadduties with #6, which was a standard 2-8-0T from Motala which is preserved in Anten-Gräfsnes Preserved line in southwest. The road had also a number of smaller steam power and most of them are still around on preserved 891mm gauge lines in the country, aswell a fair amount of rolling stock. 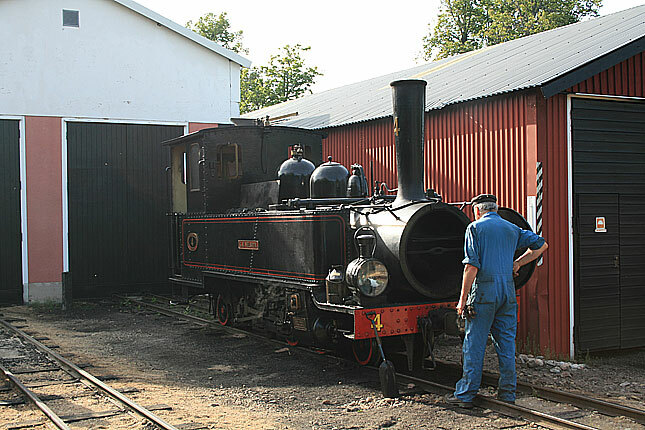 The Thor operates on the longest narrowgauge museum, 27 km.s long Uppsala-Lenna Järnväg. 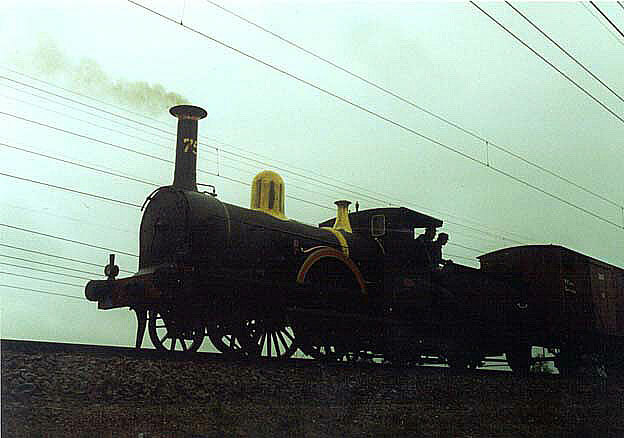 The other mainline engine on BLJ, Was the 2-8-0T # 6. 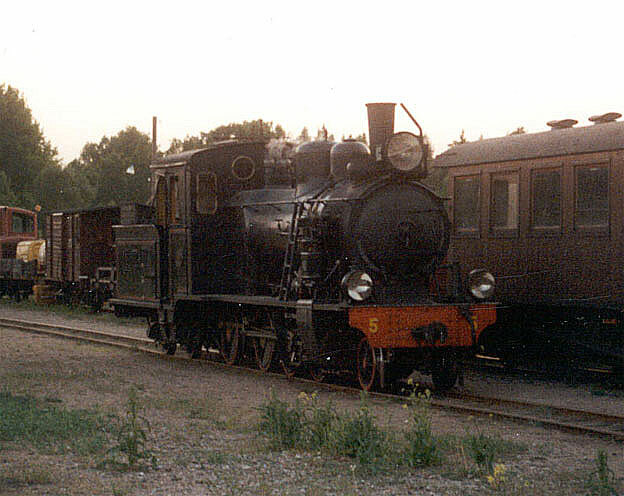 The engine was the only superheated engine on the line and ventured to west of the country and now is a resident of Anten-Gräfsnäs preserved line. 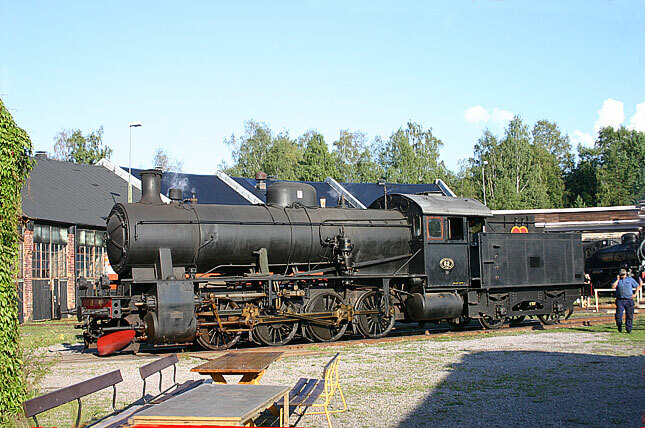 The engine was more or less a standard tank engine on Swedish 3' gauge, designed and built by Motala. 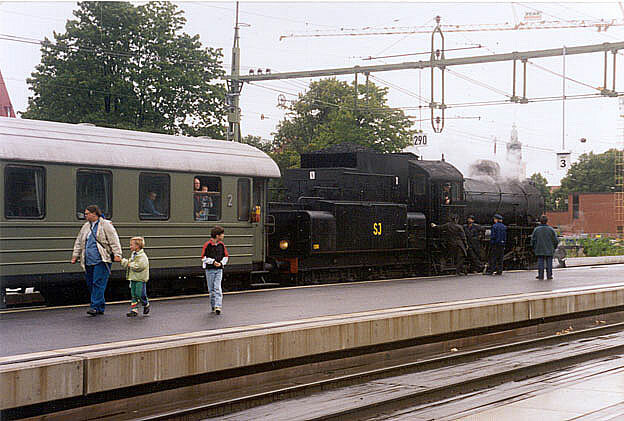 Photo in Anten, May 2000.